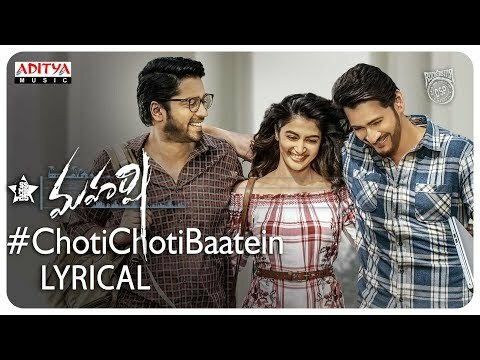 Listen & Enjoy #ChotiChotiBaatein Lyrical From #Maharshi Movie. Click here to share on Facebook- https://goo.gl/bTR3EA Audio also available on: Wynk- https://goo.gl/4GJfwj JioSaavn- https://goo.gl/Ptc7So AmazonMusic- https://goo.gl/rBB1QC Gaana- https://goo.gl/H7EHiu AppleMusic- https://goo.gl/dg5WyA Spotify- https://goo.gl/a2tiiC Movie : Maharshi Director : Vamshi Paidipally Producers : Raju, Ashwini Dutt Chalasani, Pearl V. Potluri - Param V. Potluri Banners : Sri Venkateswara Creations, Vyjayanthi Movies, PVP Cinema Song Name : Choti Choti Baatein Singer : Devi Sri Prasad Lyrics : Shree Mani Music : Devi Sri Prasad Keyboards: DSP, Vikas Badisa & Kalyan Rhythm: Kalyan Guitars: DSP Additional Guitars : Godfray Immauel Flute: Kiran Accordion: Rajkumar Violin & Viola: Rithu Vysakh Chorus: Ranina, Anitha, Roshini & Surmukhi Chorus conducted by J Chittey Prakash Ra Album Mixed & Mastered by A. Uday Kumar @ "Brindavan–The Garden Of Music" Album Recorded by A. Uday Kumar, T. Uday Kumar & Suresh Kumar Taddi. Orchestra In-Charge: Murugan Studio Asst: Pugalendhi Album Co-ordinator: B. Manikandan Music Label: Aditya Music. Set "Choti Choti Baatein" as Caller Tune Airtel user dial "5432116872794" vodafone user dial "53711146271" Idea user dial "5678911146271" BSNL user dial "56711146271" #MaheshBabu #SSMB25 #MaharshiSongs ---------------------------------------------------------------------------------------------------------------------------------------------------- Enjoy and stay connected with us!! ►Subscribe us on Youtube: http://bit.ly/adityamusic ►Like us on Facebook: http://www.facebook.com/adityamusic ►Follow us on Twitter: http://www.twitter.com/adityamusic ►Follow us on Instagram: https://www.instagram.com/adityamusicindia ►Follow us on LinkedIn: http://bit.ly/2Pp6ze3 ►Circle us: https://plus.google.com/+adityamusic SUBSCRIBE Aditya Music Channels for unlimited entertainment: ►For New Movies in HD: http://www.youtube.com/Adityamovies ►For Songs with Lyrics: https://www.youtube.com/AdityaMusic ►For Devotional Songs: http://www.youtube.com/AdityaDevotional ►For Kids Educational: http://www.youtube.com/AdityaKids →"మా పాట మీ నోట" Telugu Lyrical Songs - http://bit.ly/1B2EcJG →Latest Tollywood Lyric Video Songs - http://bit.ly/1Km97mg →Ever Green Classics - https://goo.gl/1fZEDy →Popular Jukeboxes - https://goo.gl/LNvAIo →Telugu Songs with Lyrics - https://goo.gl/7ZmgWT © 2019 Aditya Music India Pvt. Ltd. 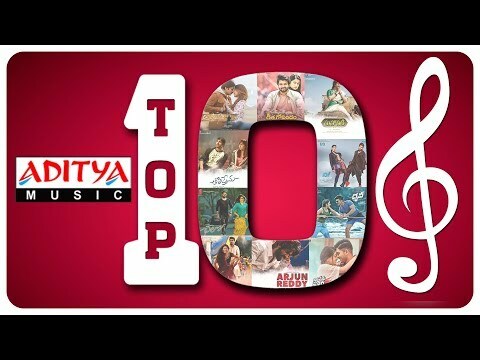 Listen and Enjoy ♫♫ Aditya Music Top 10 Hits ♫♫ Don't forget to hit Like & Share!! Click here to Share on Facebook- https://goo.gl/H9J3iS ♫Songs♫ 00:04- Inkem Inkem Inkem Kaavaale 04:30- Baitikochi Chuste 07:57- Vachinde 13:22- Ninnila 17:16- Choosi Chudangane 20:39- Mahanati 25:23- Seeti Maar 29:33- Lover Also Fighter Also 33:30- Choosa Choosa 36:51- Telisiney Na Nuvvey Song:Inkem Inkem Inkem Kaavaale Movie:Geetha Govindam Music:Gopi Sundar Lyrics:Ananta Sriram Singer:Sid Sriram Song:Baitikochi Chuste Movie:Agnyaathavaasi Music & Singer:Anirudh Ravichander Lyrics:Shree Mani Song:Vachinde Movie:Fidaa Music:Shakthikanth Karthick Lyrics:Suddala Ashok Teja Singers:Madhu Priya, Ramky Song:Ninnila Movie:Tholi Prema Music:Thaman S Lyrics:Sri Mani Singers:Armaan Malik, Thaman S Song:Choosi Chudangane Movie:Chalo Music:Mahati Swara Sagar Lyrics:Bhaskar Bhatla Singers:Anurag Kulkarni, Mahathi Swara Sagar Song:Mahanati Movie:Mahanati Music:Mickey J Meyer Lyrics:Ramajogayya Sastry Singer:Anurag Kulkarni Song:Seeti Maar Movie:DJ Music:Devi Sri Prasad Lyrics:Balaji Singers:Jaspreet Jasz, Rita Song:Lover Also Fighter Also Movie:Naa Peru Surya Naa Illu India Music:Vishal - Shekhar Lyrics:Ramajogayya Sastry Singers:Shekhar Ravjiani Song:Choosa Choosa Movie:Dhruva Music:Hiphop Tamizha Lyrics:Chandrabose Singers:Padmalatha,Sniggy Song:Telisiney Na Nuvvey Movie:Arjun Reddy Music:Radhan Lyrics:Rambabu Gosala Singer:Revanth -------------------------------------------------------------------------------------------------------------------------------------------------------- Enjoy and stay connected with us!! ►Subscribe us on Youtube: http://bit.ly/adityamusic ►Like us on Facebook: http://www.facebook.com/adityamusic ►Follow us on Twitter: http://www.twitter.com/adityamusic ►Follow us on Instagram: https://www.instagram.com/adityamusicindia ►Follow us on LinkedIn: http://bit.ly/2Pp6ze3 ►Circle us: https://plus.google.com/+adityamusic SUBSCRIBE Aditya Music Channels for unlimited entertainment: ►For New Movies in HD: http://www.youtube.com/Adityamovies ►For Songs with Lyrics: https://www.youtube.com/AdityaMusicNM... ►For Devotional Songs: http://www.youtube.com/AdityaDevotional ►For Kids Educational: http://www.youtube.com/AdityaKids →"మా పాట మీ నోట" Telugu Lyrical Songs - http://bit.ly/1B2EcJG →Latest Tollywood Lyric Video Songs - http://bit.ly/1Km97mg →Ever Green Classics - https://goo.gl/1fZEDy →Popular Jukeboxes - https://goo.gl/LNvAIo →Telugu Songs with Lyrics - https://goo.gl/7ZmgWT © 2018 Aditya Music India Pvt. 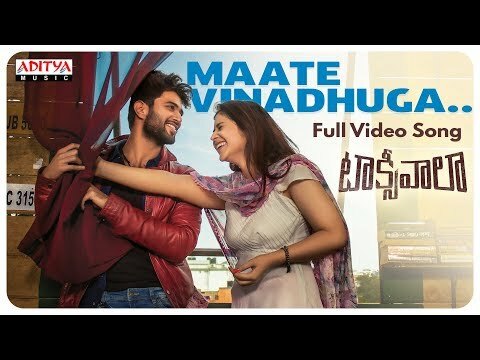 Ltd.
Watch & Enjoy #MaateVinadhuga Full Video Song From #Taxiwaala Telugu Movie. Starring #VijayDeverakonda, #PriyankaJawalkar and #MalavikaNair. Produced by SKN, Music Composed by Jakes Bejoy. Directed by Rahul Sankrityan. Under the Banner of UV Creations and GA2 Pictures. Click here to share on Facebook- https://goo.gl/oWoaja Listen on Apple Music- https://goo.gl/1iPDXB Audio also available on: JioSaavn- https://goo.gl/5T3Wch Gaana- https://goo.gl/yDnzrW Wynk- https://goo.gl/BNKesr Spotify- https://goo.gl/QBZLiJ Song: Maate Vinadhuga Movie: Taxiwaala Banners : UV Creations and GA2 Pictures Producer : SKN Director: Rahul Sankrityan Music: Jakes Bejoy Lyrics: Krishna Kanth Singer: Sid Sriram Backing Vocals: Ajaey Shravan, Deepika, Balu Thankachan, Jakes ScreenPlay-Dialogues: Saikumar Reddy Cast: Vijay Deverakonda, Priyanka Jawalkar and Malavika Nair Cinematographer: Sujith Sarang Editor-Di Colorist: Sreejith Sarang Music Label: Aditya Music. Music Production: Composed, Arranged and Programmed by Jakes Bejoy Additional Arrangements: Jasim Mixed and Mastered by Balu Thankachan @ 20db SoundStudios, Chennai Production Assisted by Sethu Thankachan Vocal Tuning: Avinaash Sathish Engineers: Rohit Gopalakrishnan @ Mindscore Music Live Players: Acoustic and Electric Guitar: Sumesh Parameshwar Sitar: Kishore Strings: Andrew Gerlicher Flute: Kiran Bass: Napier Naveen Kumar Percussion: Hubert Maran Set "Maate Vinadhuga" as Caller Tune Airtel user dial "5432116633217" Idea user dial "5678910734975" BSNL user dial "56710734975" Set "Perige Vegame" as Caller Tune Airtel user dial "5432116633136" Idea user dial "5678910734955" BSNL user dial "56710734955" -------------------------------------------------------------------------------------------------------------------------------------------------------- Enjoy and stay connected with us!! ►Subscribe us on Youtube: http://bit.ly/adityamusic ►Like us on Facebbok: http://www.facebook.com/adityamusic ►Follow us on Twitter: http://www.twitter.com/adityamusic ►Follow us on Instagram: https://www.instagram.com/adityamusicindia ►Follow us on LinkedIn: http://bit.ly/2Pp6ze3 ►Circle us: https://plus.google.com/+adityamusic SUBSCRIBE Aditya Music Channels for unlimited entertainment: ►For New Movies in HD: http://www.youtube.com/Adityamovies ►For Songs with Lyrics: https://www.youtube.com/AdityaMusicNM... ►For Devotional Songs: http://www.youtube.com/AdityaDevotional ►For Kids Educational: http://www.youtube.com/AdityaKids →"మా పాట మీ నోట" Telugu Lyrical Songs - http://bit.ly/1B2EcJG →Latest Tollywood Lyric Video Songs - http://bit.ly/1Km97mg →Ever Green Classics - https://goo.gl/1fZEDy →Popular Jukeboxes - https://goo.gl/LNvAIo →Telugu Songs with Lyrics - https://goo.gl/7ZmgWT © 2018 Aditya Music India Pvt. Ltd. Listen and Enjoy Best of 2018 Video Songs Jukebox Vol-2. Don't forget to hit Like & Share!! Best of 2018 songs Click here to share on Facebook- https://goo.gl/jSKH4A ♫♫ Songs ♫♫ 00:04 Inkem Inkem Inkem Kaavaale 03:55 My World Is Flying 07:42 Vaaru Veeru 12:22 Iraga Iraga 16:20 Mahanati 22:41 Naalo Chilipi Kala (Theme Song) 26:20 Emo Emo Emo 30:40 Asha Pasham 34:57 Aagi Aagi 41:42 Egireney Manasu 45:13 Mellaga Mellaga Song: Inkem Inkem Inkem Kaavaale Movie: Geetha Govindam Music: Gopi Sundar Lyrics: Ananta Sriram Singer: Sid Sriram Song: My World Is Flying Movie: Hello Guru Prema Kosame Music: Devi Sri Prasad Lyrics: Srimani Singer: Alphons Joseph Song: Vaaru Veeru Movie: Devadas Music: Manisharma Lyrics: Sirivennela Seetharama Sastry Singer: Anurag Kulkarni, Anjana Sowmya Song: Iraga Iraga Movie: Naa Peru Surya Naa Illu India Music: Vishal - Shekhar Lyrics: Ramajogayya Sastry Singers: Rahul Sipligunj, Mohana Bhogaraju Song: Mahanati Movie: Mahanati Music: Mickey J Meyer Lyrics: Ramajogayya Sastry Singer: Anurag Kulkarni Song: Naalo Chilipi Kala Movie: Lover Music: Sai Kartheek Lyrics: Sri Mani Singer: Yazin Nizar Song: Emo Emo Emo Movie: Devadas Music: Manisharma Lyrics: Sirivennela Seetharama Sastry Singers: Sid Sriram, Ramya Behara Song: Asha Pasham Movie: Care Of Kancharapalem Music: Sweekar Agasthi Lyrics: Vishwa Singer: Anurag Kulkarni Song: Aagi Aagi Movie: Ee Nagaraniki Emaindi Music: Vivek Sagar Lyrics: Krishna Kanth Singers: Anurag Kulkarni, Manisha Eerabathini Song: Egireney Manasu Movie: @Narthanasala Music: Mahati Swara Sagar Lyrics: Bhaskarabhatla Ravi Kumar Singers: Mahati Swara Sagar, Sameera Bharadwaj Song: Mellaga Mellaga Movie: Chi La Sow Music: Prashanth R Vihari Lyrics: Sri Sai Kiran Singers: Chinmayi Sripada, ------------------------------------------------------------------------------------------ Enjoy and stay connected with us!! ►Subscribe us on Youtube: http://bit.ly/adityamusic ►Like us on Facebook: http://www.facebook.com/adityamusic ►Follow us on Twitter: http://www.twitter.com/adityamusic ►Follow us on Instagram: https://www.instagram.com/adityamusicindia ►Follow us on LinkedIn: http://bit.ly/2Pp6ze3 ►Circle us: https://plus.google.com/+adityamusic SUBSCRIBE Aditya Music Channels for unlimited entertainment: ►For New Movies in HD: http://www.youtube.com/Adityamovies ►For Songs with Lyrics: https://www.youtube.com/AdityaMusicNM... ►For Devotional Songs: http://www.youtube.com/AdityaDevotional ►For Kids Educational: http://www.youtube.com/AdityaKids →"మా పాట మీ నోట" Telugu Lyrical Songs - http://bit.ly/1B2EcJG →Latest Tollywood Lyric Video Songs - http://bit.ly/1Km97mg →Ever Green Classics - https://goo.gl/1fZEDy →Popular Jukeboxes - https://goo.gl/LNvAIo →Telugu Songs with Lyrics - https://goo.gl/7ZmgWT © 2018 Aditya Music India Pvt. Ltd. Listen & Enjoy Mahesh Babu Special Compilation Click here to share on Facebook- https://bit.ly/2VaJEcl Movie : Athadu Song : Adaraku Lyrics : Viswa Music : Mani Sharma Singer : Viswa Movie: Athidi Song : Khabaddarani Lyrics : Sirivennela Sitarama Sastry Music : Mani Sharma Singers : Naveen, Rahul Movie : Dookudu Song : Nee Dookudu Lyrics : Viswa Music : Thaman.S Singer : Shankar Mahadevan Movie: Pokiri Song : Jagadame Lyrics : Kandikonda Music : Mani Sharma Singers : Kunal Ganjawala Movie: Takkari Donga Song : Naluguriki Lyrics : Chandra Bose Music : Mani Sharma Singer : Shankar Mahadevan ------------------------------------------------------------------------------------------ Enjoy and stay connected with us!! ►Subscribe us on Youtube: http://bit.ly/adityamusic ►Like us on Facebook: http://www.facebook.com/adityamusic ►Follow us on Twitter: http://www.twitter.com/adityamusic ►Follow us on Instagram: https://www.instagram.com/adityamusicindia ►Follow us on LinkedIn: http://bit.ly/2Pp6ze3 ►Circle us: https://plus.google.com/+adityamusic SUBSCRIBE Aditya Music Channels for unlimited entertainment: ►For New Movies in HD: http://www.youtube.com/Adityamovies ►For Songs with Lyrics: https://www.youtube.com/AdityaMusic ►For Devotional Songs: http://www.youtube.com/AdityaDevotional ►For Kids Educational: http://www.youtube.com/AdityaKids →"మా పాట మీ నోట" Telugu Lyrical Songs - http://bit.ly/1B2EcJG →Latest Tollywood Lyric Video Songs - http://bit.ly/1Km97mg →Ever Green Classics - https://goo.gl/1fZEDy →Popular Jukeboxes - https://goo.gl/LNvAIo →Telugu Songs with Lyrics - https://goo.gl/7ZmgWT © 2019 Aditya Music India Pvt. Ltd. 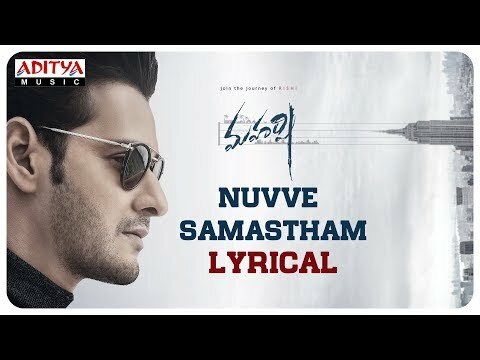 Listen & Enjoy #NuvveSamastham Lyrical From #Maharshi Movie. Click here to share on Facebook- https://bit.ly/2Z7Qoak Audio also available on: Wynk- https://bit.ly/2DfvwVb JioSaavn- https://bit.ly/2v20Hi6 AmazonMusic- https://amzn.to/2v2O4mY AppleMusic- https://apple.co/2ULnKNB Spotify- https://spoti.fi/2P7JkpF Movie : Maharshi Director : Vamshi Paidipally Producers : Raju, Ashwini Dutt Chalasani, Pearl V. Potluri - Param V. Potluri Banners : Sri Venkateswara Creations, Vyjayanthi Movies, PVP Cinema Song Name : Nuvve Samastham Singer : Yazin Nizar Lyrics : Shree Mani Music : Devi Sri Prasad Keyboards: Dsp & Kaylan Additional Keyboards: Kp Rhythm: Kalyan Flute: Kiran Kumar Chorus: Ranina, Anitha, Roshini & Surmukhi Live Violins performed by Chennai Strings Orchestra Strings & Chorus conducted by J Chittey Prakash Rao Album Mixed & Mastered by A. Uday Kumar @ "Brindavan–The Garden Of Music" Album Recorded by A. Uday Kumar, T. Uday Kumar & Suresh Kumar Taddi. Orchestra In-Charge: Murugan Studio Asst: Pugalendhi Album Co-ordinator: B. Manikandan Music Label: Aditya Music. Set "Nuvve Samastham" as Caller Tune Airtel user dial "5432116890779" Vodafone user dial "53711173755" Idea user dial "5678911173755" BSNL user dial "56711173755" Set "Join The Journey Of Rishi" as Caller Tune Airtel user dial 5432116891353" Vodafone user dial "53711174115" Idea user dial "5678911174115" BSNL user dial "56711174115" ------------------------------------------------------------------------------------------------------------------------------------------------------ Enjoy and stay connected with us!! ►Subscribe us on Youtube: http://bit.ly/adityamusic ►Like us on Facebook: http://www.facebook.com/adityamusic ►Follow us on Twitter: http://www.twitter.com/adityamusic ►Follow us on Instagram: https://www.instagram.com/adityamusicindia ►Follow us on LinkedIn: http://bit.ly/2Pp6ze3 ►Circle us: https://plus.google.com/+adityamusic SUBSCRIBE Aditya Music Channels for unlimited entertainment: ►For New Movies in HD: http://www.youtube.com/Adityamovies ►For Songs with Lyrics: https://www.youtube.com/AdityaMusic ►For Devotional Songs: http://www.youtube.com/AdityaDevotional ►For Kids Educational: http://www.youtube.com/AdityaKids →"మా పాట మీ నోట" Telugu Lyrical Songs - http://bit.ly/1B2EcJG →Latest Tollywood Lyric Video Songs - http://bit.ly/1Km97mg →Ever Green Classics - https://goo.gl/1fZEDy →Popular Jukeboxes - https://goo.gl/LNvAIo →Telugu Songs with Lyrics - https://goo.gl/7ZmgWT © 2019 Aditya Music India Pvt. Ltd.
Watch & Enjoy#Undiporaadhey Full Video Song From #Hushaaru (Celebration Of Bad Behaviour) Telugu Movie. Starring #TejusKancherla, #TejKurapati, #DineshTej, #AbhinavMedishetti, #DakshaNagarkar, #PriyaVadlamani, #HemalIngle, #RamyaPasupuleti, #RahulRamaKrishna. 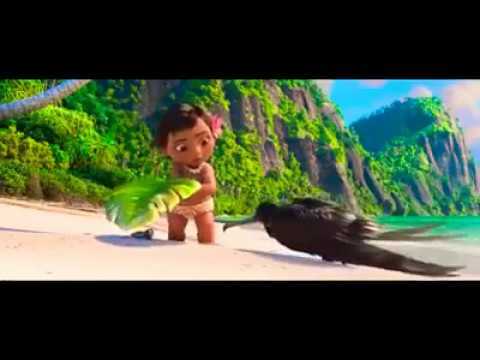 Music Composed by Radhan. Produced by Bekkem Venu Gopal (Gopi) and Directed by Sree Harsha Konuganti, Under the Banner of Lucky Media. Click here to share on Facebook- https://goo.gl/89wGt7 Audio also available on: JioSaavn- https://goo.gl/aTswut Wynk- https://goo.gl/nBWaAp AmazonMusic- https://goo.gl/SW6TkF Gaana- https://goo.gl/vztJjX AppleMusic- https://goo.gl/gq5NyF Spotify- https://goo.gl/epWcuw Song: Undiporaadhey Movie: Hushaaru (Celebration Of Bad Behaviour) Banner: Lucky Media Producers: Bekkem venugopal & Riaz Co-Producer: Veena Rani Associate Producers: Linga Srinivas, Laxmi Narayana Director: Sree Harsha Konuganti Music: Radhan Lyricist: Kittu Vissapragada Singer: Sid Sriram Cast: Tejus Kancherla, Tej Kurapati, Dinesh Tej, Abhinav Medishetti, Daksha Nagarkar, Priya Vadlamani, Hemal Ingle, Ramya Pasupuleti, Rahul Rama Krishna Dop: Raj Thota Editor: Vijay Vardhan Kavuri Music Label: Aditya Music. Set "Undiporaadhey" as Caller Tune Airtel user dial "5432116617615" Idea user dial "5678910705795" BSNL user dial "56710705795" ------------------------------------------------------------------------------------------ Enjoy and stay connected with us!! ►Subscribe us on Youtube: http://bit.ly/adityamusic ►Like us on Facebook: http://www.facebook.com/adityamusic ►Follow us on Twitter: http://www.twitter.com/adityamusic ►Follow us on Instagram: https://www.instagram.com/adityamusicindia ►Follow us on LinkedIn: http://bit.ly/2Pp6ze3 ►Circle us: https://plus.google.com/+adityamusic SUBSCRIBE Aditya Music Channels for unlimited entertainment: ►For New Movies in HD: http://www.youtube.com/Adityamovies ►For Songs with Lyrics: https://www.youtube.com/AdityaMusicNM... ►For Devotional Songs: http://www.youtube.com/AdityaDevotional ►For Kids Educational: http://www.youtube.com/AdityaKids →"మా పాట మీ నోట" Telugu Lyrical Songs - http://bit.ly/1B2EcJG →Latest Tollywood Lyric Video Songs - http://bit.ly/1Km97mg →Ever Green Classics - https://goo.gl/1fZEDy →Popular Jukeboxes - https://goo.gl/LNvAIo →Telugu Songs with Lyrics - https://goo.gl/7ZmgWT © 2019 Aditya Music India Pvt. 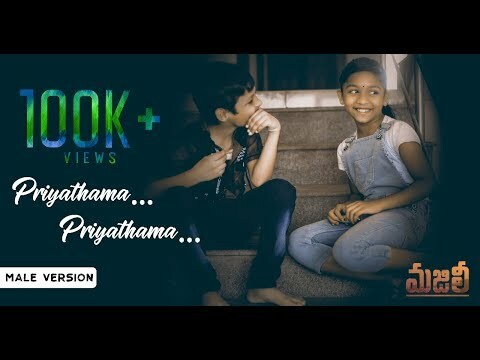 Ltd.
Watch & Enjoy Priyathama Priyathama Lyrical From #Majili Movie. #NagaChaitanya #Samantha #DivyanshaKaushik Click here to share on Facebook- https://goo.gl/oYqjWF Audio also available on: Wynk- https://goo.gl/gUwmxy JioSaavn- https://goo.gl/xJK9SN AmazonMusic- https://goo.gl/gQLMiD AppleMusic- https://goo.gl/fNGzuz Gaana- https://goo.gl/Tk1YBi Spotify- https://goo.gl/PqYCXg Song: Priyathama Priyathama Movie : Majili Banner: Shine Screens Producers: Sahu Garapati and Harish Peddi Story & Direction: Shiva Nirvana Music: Gopi Sunder Lyrics: Chaitanyaprasad Singer: Chinmayi Sripada Cast: Naga Chaitanya, Samantha, Divyansha Kaushik, Rao Ramesh, Posani Krishna Murali, Subbaraju, Rajasri Nair DOP: Vishnu Sarma Editor: Prawin Pudi Backing Vocals : Divya S Menon Flute : Josy Alpy Additional Programming : Prakash Alex Guitar : Sumesh Parameswar Percussion : Sunil Kumar Nadaswara : Ok Gopi Flute : Josy Alpy Music Production Manager : Babu Velayudhan Technical Support : Godson Kalappurakkal Songs Recorded @ : Sunsa Digital Workstation, Chennai & Cochin. Engineered By : Midhun Anand, Krishnalal.Bs, Nikhil Mathews, Gopi Sundar. Song Mixed & Mastered By Midhun Anand @ Sunsa Digital Workstation. Music Label: Aditya Music. Set "Priyathama Priyathama" as Caller Tune Airtel user dial "5432116873092" Vodafone user dial "53711146256" Idea user dial "5678911146256" BSNL user dial "56711146256" -------------------------------------------------------------------------------------------------------------------------------------------------------- Enjoy and stay connected with us!! ►Subscribe us on Youtube: http://bit.ly/adityamusic ►Like us on Facebook: http://www.facebook.com/adityamusic ►Follow us on Twitter: http://www.twitter.com/adityamusic ►Follow us on Instagram: https://www.instagram.com/adityamusicindia ►Follow us on LinkedIn: http://bit.ly/2Pp6ze3 ►Circle us: https://plus.google.com/+adityamusic SUBSCRIBE Aditya Music Channels for unlimited entertainment: ►For New Movies in HD: http://www.youtube.com/Adityamovies ►For Songs with Lyrics: https://www.youtube.com/AdityaMusic ►For Devotional Songs: http://www.youtube.com/AdityaDevotional ►For Kids Educational: http://www.youtube.com/AdityaKids →"మా పాట మీ నోట" Telugu Lyrical Songs - http://bit.ly/1B2EcJG →Latest Tollywood Lyric Video Songs - http://bit.ly/1Km97mg →Ever Green Classics - https://goo.gl/1fZEDy →Popular Jukeboxes - https://goo.gl/LNvAIo →Telugu Songs with Lyrics - https://goo.gl/7ZmgWT © 2019 Aditya Music India Pvt. Ltd. 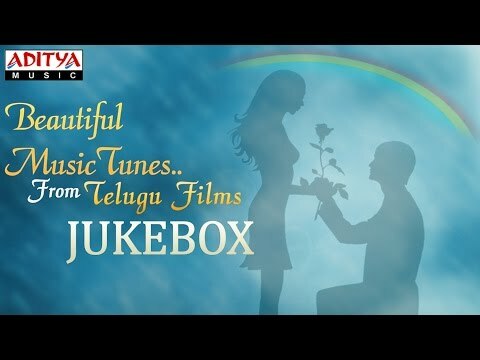 Listen & Enjoy Beautiful Music Tunes From Telugu Films Relax & Enjoy,This Jukebox Contains 18 amazing Tracks. ♫►Beautiful Music Tunes From Telugu Films ◄♫ 00:34 - Thalachithalachi - 7G Brundhavana Colony 01:55 - Nee Choopule - Endukante Premanta 04:34 - Daredumdadum - Mukunda 06:30 - Violin Song - Idharammayilatho 07:48 - Nuvve Na Shwasa - Okariki Okaru 10:06 - Nuvvem Maya - Okkadu 11:48 - Preminche Premava - Nuvvu Nenu Prema 13:25 - Ne Tholisariga - Santhosham 15:56 - Mellaga Mellaga-Female - Asha Asha Asha 18:42 - Poovullo Daagunna - Jeans 21:45 - Nee Sneham - Manasantha Nuvve 23:48 - Telusuna - Sontham 25:40 - Nuvvu Nuvvu - Khadgam 27:52 - Feel My Love - Aarya 29:24 - Eeru Vaka - Oke Okkadu 31:29 - Nenu Nenuga - Manmadhudu 33:28 - Povodhe Prema - Oye 35:22 - Manasuna Mansuga - Love Birds. --------------------------------------------------------- Enjoy and stay connected with us!! ►Subscribe us on Youtube :http://bit.ly/adityamusic ►Like us: http://www.facebook.com/adityamusic ►Follow us : http://www.twitter.com/adityamusic ►Circle us : https://plus.google.com/+adityamusic SUBSCRIBE Aditya Music Channels for unlimited entertainment : ►For New Movies in HD : http://www.youtube.com/Adityamovies ►For Songs with Lyrics : https://www.youtube.com/AdityaMusicNM... ►For Devotional Songs : http://www.youtube.com/AdityaDevotional ►For Kids Educational : http://www.youtube.com/AdityaKids →"మా పాట మీ నోట" Telugu Lyrical Songs - http://bit.ly/1B2EcJG →Latest Tollywood Lyric Video Songs - http://bit.ly/1Km97mg →Ever Green Classics - https://goo.gl/1fZEDy →Popular Jukeboxes - https://goo.gl/LNvAIo →Telugu Songs with Lyrics - https://goo.gl/7ZmgWT © 2015 Aditya Music India Pvt. Ltd.
Watch & Enjoy Seeti Maar Full Video Song from DJ - Duvvada Jagannadham. #DJ Movie Starring #AlluArjun, #PoojaHegde. Directed by Harish Shankar & Produced by Dil Raju under the Banner Of Sri Venkatshwara Creations. Click here to Share on Facebook- https://goo.gl/PgLA1Q Click here for Caller Tune Codes- https://goo.gl/vnYgNd Buy Now on iTunes- https://goo.gl/GbCJex Download DJ official mobile app- https://goo.gl/xkoPzS Audio also Available on: Saavn- https://goo.gl/A1AEM7 Wynk- https://goo.gl/kwVcIZ Set "SEETI MAAR" as your caller tune- "Airtel" User Dial "5432116265737" "Idea" User Dial "567899584435" "Vodafone" User Dial "5379584435" "BSNL" User Dial "5679584435" "Telenor" User Dial "5432119584435" Song: SEETI MAAR Movie - DJ Duvvada Jagannadham Cast - Allu Arjun, Pooja Hegde Screenplay - Ramesh Reddy, Deepak Raj Story - Dialogues - Direction: Harish Shankar Cinematography : Ayananka Bose Music : Devi Sri Prasad Singers: Jaspreet Jasz & Rita Lyrics: Balaji Musicians: Keyboards: Vikas Badisa Additional Keyboard: Kalyan Rhythm: Kalyan Editor: Chota K Prasad ----------------------------------------------------------------------------------- Enjoy and stay connected with us!! ►Subscribe us on Youtube: http://bit.ly/adityamusic ►Like us: http://www.facebook.com/adityamusic ►Follow us: http://www.twitter.com/adityamusic ►Circle us: https://plus.google.com/+adityamusic SUBSCRIBE Aditya Music Channels for unlimited entertainment: ►For New Movies in HD: http://www.youtube.com/Adityamovies ►For Songs with Lyrics: https://www.youtube.com/AdityaMusicNM... ►For Devotional Songs: http://www.youtube.com/AdityaDevotional ►For Kids Educational: http://www.youtube.com/AdityaKids →"మా పాట మీ నోట" Telugu Lyrical Songs - http://bit.ly/1B2EcJG →Latest Tollywood Lyric Video Songs - http://bit.ly/1Km97mg →Ever Green Classics - https://goo.gl/1fZEDy →Popular Jukeboxes - https://goo.gl/LNvAIo →Telugu Songs with Lyrics - https://goo.gl/7ZmgWT © 2017 Aditya Music India Pvt. Ltd.
Watch & Enjoy #YentiYenti Full Video Song From GeethaGovindam Telugu Movie. Starring #VijayDevarakonda #RashmikaMandanna. Music Composed by #GopiSundar, Produced by #BunnyVas and Directed by #Parasuram, Under the banner of GA2 Pictures. Click here to share on Facebook- https://goo.gl/njRjaN Listen on Apple Music- https://goo.gl/1iPDXB Audio also available on: Saavn- https://goo.gl/5T3Wch Gaana- https://goo.gl/yDnzrW Wynk- https://goo.gl/BNKesr Idea Music- https://goo.gl/bQCFLT JioMusic- https://goo.gl/bpUaUs BookMyShow- https://goo.gl/YQSVQL Spotify- https://goo.gl/QBZLiJ Song : Yenti Yenti Movie: Geetha Govindam Banner: GA2 Pictures Producer: Bunny Vas Director: Parasuram Music: Gopi Sundar Lyrics: Sri Mani Singer: Chinmayi Cast: Vijay Devarakonda, Rashmika Mandanna All Song Composed,Arranged And Programmed By : Gopi Sundar Additional Programming : Anoop Nirichan , Vinu Uday Backing Vocals : Divya S Menon ,Nimya, Sreepriya Menon,Ajay Sathyan, Midhun Anand , Krishnalal Bs, Nikhil Mathews, Gopi Sundar. Guitar And Bass : Sumesh Parameswar - Veena : Biju Nadaswaram : Ok Gopi - Flute And Sax : Jossy Alapy Strings : Francis Xavier, Herald,Francis T S Josekuttuy, Carol George (Cochin Strings Orchestra) Music Production Manager : Babu Velayudhan Technical Support : Godson Kalapurakkal Songs Recorded @ : Sunsa Digital Workstation, Chennai & Cochin. Engineered By : Midhun Anand,Krishnalal.Bs,Nikhil Mathews,Gopi Sundar. All Songs Mixed & Mastered By Shadab Rayeen Mixed And Master By Shadab Rayeen @ New Edge Assistant Engineers Abhishek Sortey & Dhananjay Khapekar Music Label: Aditya Music. Set "Yenti Yenti" as Caller Tune Airtel user dial "5432116563158" Idea user dial "5678910582795" BSNL user dial "56710582795" ----------------------------------------------------------------------------------------------------------- Enjoy and stay connected with us!! ►Subscribe us on Youtube: http://bit.ly/adityamusic ►Like us: http://www.facebook.com/adityamusic ►Follow us: http://www.twitter.com/adityamusic ►Circle us: https://plus.google.com/+adityamusic SUBSCRIBE Aditya Music Channels for unlimited entertainment: ►For New Movies in HD: http://www.youtube.com/Adityamovies ►For Songs with Lyrics: https://www.youtube.com/AdityaMusicNM... ►For Devotional Songs: http://www.youtube.com/AdityaDevotional ►For Kids Educational: http://www.youtube.com/AdityaKids →"మా పాట మీ నోట" Telugu Lyrical Songs - http://bit.ly/1B2EcJG →Latest Tollywood Lyric Video Songs - http://bit.ly/1Km97mg →Ever Green Classics - https://goo.gl/1fZEDy →Popular Jukeboxes - https://goo.gl/LNvAIo →Telugu Songs with Lyrics - https://goo.gl/7ZmgWT © 2018 Aditya Music India Pvt. 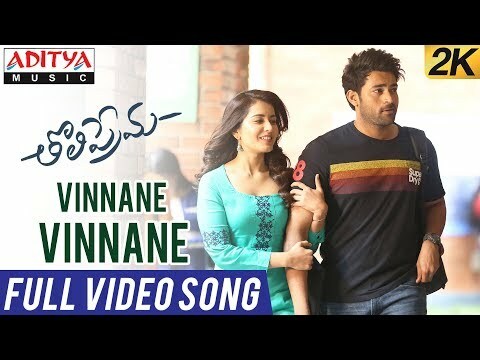 Ltd.
Watch & Enjoy #VinnaneVinnane Full Video Song From #Tholiprema Movie. Starring #Varuntej, #RaasiKhanna.Directed By #VenkyAtluri, Music Composed By #SSThaman, Produced by BVSN PRASAD under the Banner of Sri Venkateswara Cine Chitra. Click here to share on Facebook- https://goo.gl/NoMfvX Listen on Apple Music- https://goo.gl/zDRt8e Audio also available on: Saavn- https://goo.gl/D9cheb Gaana- https://goo.gl/RA41Y9 Raaga- https://goo.gl/T8mHzi Wynk- https://goo.gl/mzXgnh JioMusic- https://goo.gl/soKBNf Song: Vinnane Vinnane Movie: Tholiprema Banner: Sri Venkateswara Cine Chitra Producer: BVSN PRASAD Director: Venky Atluri Starring: VarunTej, Raasi Khanna Music: SS Thaman Lyrics: Sri Mani Singer: Armaan Malik Cinematography : George C. Williams Editor : Naveen Nooli Art Director : Kiran Kumar Musicians : All songs programmed & arranged by Thaman S Flute - Kamalakar Violin : Sandilya Veena : Sree Vaani , Rajesh Vaithi , haritha Guitar - Arun Chillaveru , Vagu Mazhan , Keba Additional Vocal arrangement - Sri Krishna , Strings & Harp - Seenu Live percussion - the cult drum company - by Kishore & Thaman. Chennai strings section conducted by - Ravikumar Songs recorded at V STUDIOS ( chennai ) YRF Mumbai & New Edge Mumbai By Osho Mixed & Mastered by Shadab Rayeeen @ New Edge ( Mumbai & New York ) Program Co Ordinator : Manigandan Studio assistance by Baskar, Seenu Music Lable: Aditya Music Set "Vinnane Vinnane" as Caller Tune Airtel user dial "5432116470518" Idea user dial "5678910158096" BSNL user dial "56710158096" ------------------------------------------------------------------------------------------ Enjoy and stay connected with us!! ►Subscribe us on Youtube: http://bit.ly/adityamusic ►Like us: http://www.facebook.com/adityamusic ►Follow us: http://www.twitter.com/adityamusic ►Circle us: https://plus.google.com/+adityamusic SUBSCRIBE Aditya Music Channels for unlimited entertainment: ►For New Movies in HD: http://www.youtube.com/Adityamovies ►For Songs with Lyrics: https://www.youtube.com/AdityaMusicNM... ►For Devotional Songs: http://www.youtube.com/AdityaDevotional ►For Kids Educational: http://www.youtube.com/AdityaKids →"మా పాట మీ నోట" Telugu Lyrical Songs - http://bit.ly/1B2EcJG →Latest Tollywood Lyric Video Songs - http://bit.ly/1Km97mg →Ever Green Classics - https://goo.gl/1fZEDy →Popular Jukeboxes - https://goo.gl/LNvAIo →Telugu Songs with Lyrics - https://goo.gl/7ZmgWT © 2018 Aditya Music India Pvt. Ltd.
Watch & Enjoy #HelloGuruPremaKosame Full Video Song From Telugu Movie #HelloGuruPremaKosame. Starring#RamPothineni, #AnupamaParameswaran. Music Composed by #DeviSriPrasad, Produced by #Shirish & #Lakshman. Directed by #TrinadhRaoNakkina, Presented by #DilRaju, Under the banner of Sri Venkateswara Creations. Click here to share on Facebook- https://goo.gl/eYC4rv Listen on Apple Music- https://goo.gl/W5BLTA Audio also available on: Saavn- https://goo.gl/73urKT Gaana- https://goo.gl/DLx1Vj Wynk- https://goo.gl/bt5DxV JioMusic- https://goo.gl/yuyJ6J Spotify- https://goo.gl/3XqM3B Song: Hello Guru Prema Kosame Movie: Hello Guru Premakosame Banner: Sri Venkateswara Creations Presents By: Dil Raju Produced By: Shirish, Lakshman Direction: Trinadh rao Nakkina Music: Devi Sri Prasad Lyrics: Srimani Singers: Sagar, Ranina Reddy Musicians: Keyboards: KP & Vikas Rhythm: KP & Kalyan Trumpet & Trombone: Babu Frets & Guitars: Subhani Live Instruments conducted by J Chitty Prakash Rao Album Mixed & Mastered by A.Uday Kumar@ “Brindavan- The Garden Of Music” Album Recorded By A.Uday Kumar, T. Uday Kumar & Suresh Kumar Taddi. Orchestra In-Charge: Murugan Studio Asst: Pugalendhi Alubm Co-Ordinator: B.Manikandan Music Label: Aditya Music. Set "Hello Guru Prema Kosame" as Caller Tune Airtel user dial "5432116606920" Idea user dial "5678910687696" BSNL user dial "56710687696" ----------------------------------------------------------------------------------------------------------- Enjoy and stay connected with us!! ►Subscribe us on Youtube: http://bit.ly/adityamusic ►Like us: http://www.facebook.com/adityamusic ►Follow us: http://www.twitter.com/adityamusic ►Circle us: https://plus.google.com/+adityamusic SUBSCRIBE Aditya Music Channels for unlimited entertainment: ►For New Movies in HD: http://www.youtube.com/Adityamovies ►For Songs with Lyrics: https://www.youtube.com/AdityaMusicNM... ►For Devotional Songs: http://www.youtube.com/AdityaDevotional ►For Kids Educational: http://www.youtube.com/AdityaKids →"మా పాట మీ నోట" Telugu Lyrical Songs - http://bit.ly/1B2EcJG →Latest Tollywood Lyric Video Songs - http://bit.ly/1Km97mg →Ever Green Classics - https://goo.gl/1fZEDy →Popular Jukeboxes - https://goo.gl/LNvAIo →Telugu Songs with Lyrics - https://goo.gl/7ZmgWT © 2018 Aditya Music India Pvt. Ltd.
Watch & Enjoy Neethoney Dance Full Video Song From Dhruva Movie. Starring Ram Charan Tej, Rakul Preet, Arvind Swamy & Navdeep, Music Composed By Hiphop Tamizha, Directed by Surender Reddy & Produced By Allu Aravind under The Banner of Geetha Arts. Click here to Share Facebook- http://bit.ly/2kcwrMV Click here for Dhruva Caller Tune Codes- http://bit.ly/2fRtXn7 Download Dhruva official Mobile App on Google Play- http://bit.ly/DhruvaApp Buy Now on iTunes- http://apple.co/2fxo0YO Buy Dhruva Original Audio CD's on- http://bit.ly/DhruvaACD Dhruva Audio Available on: Saavn- http://bit.ly/2fxo0Ik Wynk- http://bit.ly/2fetTMa Hungama- http://bit.ly/2fRQKiR Gaana- http://bit.ly/2fxnKZI Erosnow- http://bit.ly/2fxSB8t Song : Neethoney Dance Movie : Dhruva Banner : Geetha Arts Producer : Allu Aravind Director : Surender Reddy Music : Hiphop Tamizha Singers: Hiphop Tamizha, Nikitha Gandhi Lyrics: Chandrabose Starring : Ram Charan Tej, Rakul Preet, Arvind Swamy & Navdeep ------------------------------------------------------------------------------------------------- Enjoy and stay connected with us!! ►Subscribe us on Youtube: http://bit.ly/adityamusic ►Like us: http://www.facebook.com/adityamusic ►Follow us: http://www.twitter.com/adityamusic ►Circle us: https://plus.google.com/+adityamusic SUBSCRIBE Aditya Music Channels for unlimited entertainment: ►For New Movies in HD: http://www.youtube.com/Adityamovies ►For Songs with Lyrics: https://www.youtube.com/AdityaMusicNM... ►For Devotional Songs: http://www.youtube.com/AdityaDevotional ►For Kids Educational: http://www.youtube.com/AdityaKids →"మా పాట మీ నోట" Telugu Lyrical Songs - http://bit.ly/1B2EcJG →Latest Tollywood Lyric Video Songs - http://bit.ly/1Km97mg →Ever Green Classics - https://goo.gl/1fZEDy →Popular Jukeboxes - https://goo.gl/LNvAIo →Telugu Songs with Lyrics - https://goo.gl/7ZmgWT © 2017 Aditya Music India Pvt. Ltd.
Watch & Enjoy #Power Star Pawan Kalyan Musical Journey With Aditya Music.. Here are #PowerStar Blockbuster Albums With Aditya Music: 1.Suswagatham 2.Thammudu 3.Badri 4.Kushi 5.Johnny 6.Gudumba Shankar 7.Balu 8.Bangaram 9.Annavaram 10.Jalsa 11.Teenmaar 12.Panjaa 13.Gabbar Singh 14.Cameraman Gangatho Rambabu 15.Attarrintiki Daaredi 16.Katamarayudu ----------------------------------------------------------------------------------------- Enjoy and stay connected with us!! ►Subscribe us on Youtube: http://bit.ly/adityamusic ►Like us: http://www.facebook.com/adityamusic ►Follow us: http://www.twitter.com/adityamusic ►Circle us: https://plus.google.com/+adityamusic SUBSCRIBE Aditya Music Channels for unlimited entertainment: ►For New Movies in HD: http://www.youtube.com/Adityamovies ►For Songs with Lyrics: https://www.youtube.com/AdityaMusicNM... ►For Devotional Songs: http://www.youtube.com/AdityaDevotional ►For Kids Educational: http://www.youtube.com/AdityaKids →"మా పాట మీ నోట" Telugu Lyrical Songs - http://bit.ly/1B2EcJG →Latest Tollywood Lyric Video Songs - http://bit.ly/1Km97mg →Ever Green Classics - https://goo.gl/1fZEDy →Popular Jukeboxes - https://goo.gl/LNvAIo →Telugu Songs with Lyrics - https://goo.gl/7ZmgWT © 2017 Aditya Music India Pvt. 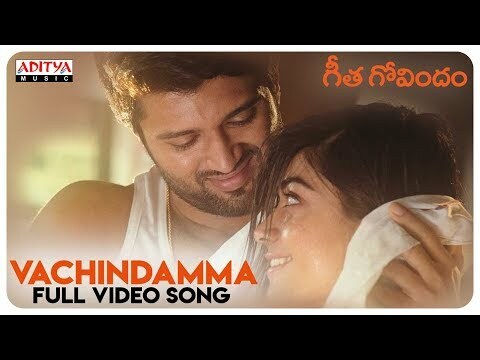 Ltd.
Watch & Enjoy #Vachindamma Full Video Song From Telugu Movie #GeethaGovindam. Starring #VijayDevarakonda #RashmikaMandanna. Music Composed by Gopi Sundar, Produced by Bunny Vas and Directed by Parasuram, Under the banner of GA2 Pictures. Click here to share on Facebook- https://goo.gl/XvVrbC Listen on Apple Music- https://goo.gl/1iPDXB Audio also available on: Saavn- https://goo.gl/Uuzuq3 Gaana- https://goo.gl/V9NW8M JioMusic- https://goo.gl/H37821 Wynk- https://goo.gl/Ft1umL Spotify- https://goo.gl/QBZLiJ Song :Vachindamma Movie: Geetha Govindam Banner: GA2 Pictures Producer: Bunny Vas Director: Parasuram Music: Gopi Sundar Lyrics: Sri Mani Singer: Sid Sriram Cast: Vijay Devarakonda, Rashmika Mandanna All Song Composed,Arranged And Programmed By : Gopi Sundar Additional Programming : Anoop Nirichan , Vinu Uday Backing Vocals : Divya S Menon ,Nimya, Sreepriya Menon,Ajay Sathyan, Midhun Anand , Krishnalal Bs, Nikhil Mathews, Gopi Sundar. Guitar And Bass : Sumesh Parameswar - Veena : Biju Nadaswaram : Ok Gopi - Flute And Sax : Jossy Alapy Strings : Francis Xavier, Herald,Francis T S Josekuttuy, Carol George (Cochin Strings Orchestra) Music Production Manager : Babu Velayudhan Technical Support : Godson Kalapurakkal Songs Recorded @ : Sunsa Digital Workstation, Chennai & Cochin. Engineered By : Midhun Anand,Krishnalal.Bs,Nikhil Mathews,Gopi Sundar. All Songs Mixed & Mastered By Shadab Rayeen Mixed And Master By Shadab Rayeen @ New Edge Assistant Engineers Abhishek Sortey & Dhananjay Khapekar Music Label: Aditya Music. Set "Vachindamma" as Caller Tune Airtel user dial "5432116563106" Idea user dial "5678910582798" BSNL user dial "56710582798" -------------------------------------------------------------------------------------------------------- Enjoy and stay connected with us!! ►Subscribe us on Youtube: http://bit.ly/adityamusic ►Like us: http://www.facebook.com/adityamusic ►Follow us: http://www.twitter.com/adityamusic ►Circle us: https://plus.google.com/+adityamusic SUBSCRIBE Aditya Music Channels for unlimited entertainment: ►For New Movies in HD: http://www.youtube.com/Adityamovies ►For Songs with Lyrics: https://www.youtube.com/AdityaMusicNM... ►For Devotional Songs: http://www.youtube.com/AdityaDevotional ►For Kids Educational: http://www.youtube.com/AdityaKids →"మా పాట మీ నోట" Telugu Lyrical Songs - http://bit.ly/1B2EcJG →Latest Tollywood Lyric Video Songs - http://bit.ly/1Km97mg →Ever Green Classics - https://goo.gl/1fZEDy →Popular Jukeboxes - https://goo.gl/LNvAIo →Telugu Songs with Lyrics - https://goo.gl/7ZmgWT © 2018 Aditya Music India Pvt. Ltd. Enjoy And Stay Connected With Us... LIKE | COMMENT | SHARE | SUBSCRIBE | KEEP SUPPORT #KABHI_JO_BADAL_BARSE #DJ_REMIX #ADITYA_MUSIC Credits:- Song: "KABHI JO BAADAL BARSE" (Dj Remix) Singer: ARIJIT SINGH Music: SHARIB, TOSHI Lyrics: TURAZ, AZEEM SHIRAZI MUSIC_LABEL:-ADITYA_MUSIC ●●●●●●●●●●●●●●●●●●●●●●●●●●●●●●● Re-Created By:- Aditya Music ◆◆◆◆◆◆◆◆◆◆◆◆◆◆◆◆◆◆◆◆◆◆◆◆◆ ♥ LIKE | SHARE | SPREAD LOVE ♥ All rights with original song creators.We do not intend want copyright infringement. *DISCLAIMER: This Following Audio/Video is Strictly meant for Promotional Purpose. We Do not Wish to make any Commercial Use of this & Intended to Showcase the Creativity Of the Artist Involved. * *The original Copyright(s) is (are) Solely owned by the Companies/Original-Artist(s)/Record-label(s). All the contents are intended to Showcase the creativity of theArtist involved and is strictly done for promotional purpose. * Thanks For stay here's If you Enjoyed Then LIKE Subscribe Share with Friends💕💕 Enjoy & stay connected with us! Watch & Enjoy Vellipomaake Full Video Song From The Movie Saahasam Swaasaga Saagipo. Starring Naga Chaitanya, Manjima Mohan, Music composed by A.R.Rahman, Directed by Gautham Vasudev Menon and Produced By M.Ravindher Reddy under the Banner Of Dwaraka Creations. Click Here to Share on Facebook- http://bit.ly/2iiBjN2 Click here for Caller Tune Codes- http://bit.ly/1UFJOx8 Download Saahasam Swaasaga Saagipo Mobile App on Google Play- http://bit.ly/SSSAPPOfcl Buy Now on iTunes- http://apple.co/26356jw Audio Available on: Saavn- http://bit.ly/1UBHPOt Erosnow- http://bit.ly/2634Ocm Gaana- http://bit.ly/1rueOsb Wynk- http://bit.ly/268WXqg Hungama- http://bit.ly/2bE66WP Raaga- http://bit.ly/2c3620R Song Name : Vellipomaake Movie Name: Saahasam Swaasaga Saagipo Music : A.R. Rahman Director: Gautham Vasudev Menon Banner: Dwaraka Creations Producer: M.Ravindher Reddy Singers: Sid Sriram, ADK Lyrics : Sreejo Actor : Naga Chaitanya Actress : Manjima Mohan ----------------------------------------------------------------------------------------- Enjoy and stay connected with us!! ►Subscribe us on Youtube: http://bit.ly/adityamusic ►Like us: http://www.facebook.com/adityamusic ►Follow us: http://www.twitter.com/adityamusic ►Circle us: https://plus.google.com/+adityamusic SUBSCRIBE Aditya Music Channels for unlimited entertainment: ►For New Movies in HD: http://www.youtube.com/Adityamovies ►For Songs with Lyrics: https://www.youtube.com/AdityaMusicNM... ►For Devotional Songs: http://www.youtube.com/AdityaDevotional ►For Kids Educational: http://www.youtube.com/AdityaKids →"మా పాట మీ నోట" Telugu Lyrical Songs - http://bit.ly/1B2EcJG →Latest Tollywood Lyric Video Songs - http://bit.ly/1Km97mg →Ever Green Classics - https://goo.gl/1fZEDy →Popular Jukeboxes - https://goo.gl/LNvAIo →Telugu Songs with Lyrics - https://goo.gl/7ZmgWT © 2016 Aditya Music India Pvt. Ltd.
Watch & Enjoy #GirraGirra Full Video Song From #F2 Movie. Starring #Venkatesh & #VarunTej, Tamannah, Mehreen. Directed by #AnilRavipudi & Music Composed by #DeviSriPrasad, Produced by Shirish-Laxman, Under the Production Of Sri Venkateswara Creations. Click here to share on Facebook - https://goo.gl/5EWbir Listen on AppleMusic- https://goo.gl/bCY9te Audio also available on: JioSaavn- https://goo.gl/XcP6Kr Wynk- https://goo.gl/uxWnqM AmazonMusic- https://goo.gl/dwkLAE Gaana- https://goo.gl/aCFKWs Spotify- https://goo.gl/yqKWtA Song: Girra Girra Movie: F2 Banner: Sri Venkateswara Creations Producer : Shirish-Laxman Director: Anil Ravipudi Music : DSP Lyrics: Balaji Singers: Sagar & MM Manasi Starring : Venkatesh, Varun Tej,Tamannah, Mehreen Keyboards: KP, Keyboards: Vikas Badisa Rhythm: Kalyan, Trumpets & Trombone: Babu PRO : Vamsi Kaka Digital Media : Nani Music Label: Aditya Music. Set "Girra Girra" as Caller Tune Airtel user dial "5432116737716" Idea user dial "5678910909518" BSNL user dial "56710909518" ------------------------------------------------------------------------------------------ Enjoy and stay connected with us!! ►Subscribe us on Youtube: http://bit.ly/adityamusic ►Like us on Facebook: http://www.facebook.com/adityamusic ►Follow us on Twitter: http://www.twitter.com/adityamusic ►Follow us on Instagram: https://www.instagram.com/adityamusicindia ►Follow us on LinkedIn: http://bit.ly/2Pp6ze3 ►Circle us: https://plus.google.com/+adityamusic SUBSCRIBE Aditya Music Channels for unlimited entertainment: ►For New Movies in HD: http://www.youtube.com/Adityamovies ►For Songs with Lyrics: https://www.youtube.com/AdityaMusic ►For Devotional Songs: http://www.youtube.com/AdityaDevotional ►For Kids Educational: http://www.youtube.com/AdityaKids →"మా పాట మీ నోట" Telugu Lyrical Songs - http://bit.ly/1B2EcJG →Latest Tollywood Lyric Video Songs - http://bit.ly/1Km97mg →Ever Green Classics - https://goo.gl/1fZEDy →Popular Jukeboxes - https://goo.gl/LNvAIo →Telugu Songs with Lyrics - https://goo.gl/7ZmgWT © 2019 Aditya Music India Pvt. Ltd. 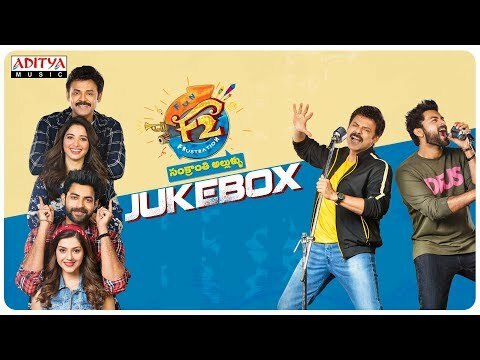 Listen & Enjoy #F2 Movie Full Songs Jukebox. Starring #Venkatesh & #VarunTej, #Mehreen, #Tamannah, Directed by #AnilRavipudi & Music Composed by #DeviSriPrasad, Produced by Shirish-Laxman, Under the Production Of Sri Venkateswara Creations. Click here to share on Facebook- https://goo.gl/G82LLg Listen on AppleMusic- https://goo.gl/ZqsNtL Audio also available on: JioSaavn- https://goo.gl/XcP6Kr Wynk- https://goo.gl/uxWnqM AmazonMusic- https://goo.gl/dwkLAE Gaana- https://goo.gl/aCFKWs Spotify- https://goo.gl/yqKWtA Movie : F2 Banner: Sri Venkateswara Creations Producer : Shirish, Lakshman Starring : Venkatesh, Varun Tej,Tamannah, Mehreen Music : DSP Cinematography : Sameer Reddy PRO : Vamsi Kaka Digital Media : Nani Music Label : Aditya Music. 00:04 - Rechipodham 03:49 - Entho Fun 08:23 - Honey Is The Best 11:33 - Dhan Dhan 15:21 - Girra Girra 20:17 - Ding Dong Rechipodham Music: Devi Sri Prasad Singer: David Simon Lyrics: Kasarla Shyam Keyboards: Vikas Badisa, Rhythm: Kalyan, Chorus: Anirudh Sushwaram, Sudharsan Ramakrishnan, Ashwin, Tanuj Menon, Sony, Anu Anand, Srisha Vijayasekhar, Srinisha Jayaseelan Chorus conducted by J Chittey Prakash Rao Entho Fun Music: Devi Sri Prasad Singer: DSP Lyrics: Shreemani Keyboards: KP, Rhythem: Kalyan, Solo Violin: Padma Shankar Bass Guiter: Mani, Flute: Kiran, Guitars: Godafray Immanuel Honey Is The Best Music: Devi Sri Prasad Singer: Hariharasudhan Lyrics: Shreemani Keyboards: KP, Rhythm: Kalyan, Solo Violin: Balaji, Trumpets & Trombone: Babu Chorus: Anirudh Sushwaram, Sudharsan Ramakrishnan, Ashwin, Tanuj Menon, Bhargavi, Roshini, Nincy & Anu Anand, Chorus conducted by J Chittey Prakash Rao Dhan Dhan Music: Devi Sri Prasad Singers: Hemachandra, Sravana Bhargavi Lyrics: Kasarla Shyam Keyboards: KP, Rhythm: Kalyan, Solo Violin: Balaji, Trumpets & Trombone: Babu Chorus: Anirudh Sushwaram, Sudharsan Ramakrishnan, Ashwin, Tanuj Menon, Bhargavi, Roshini, Nincy & Anu Anand, Chorus conducted by J Chittey Prakash Rao Girra Girra Music: Devi Sri Prasad Singers: Sagar & MM Manasi Lyrics: Balaji Keyboards: KP, Keyboards: Vikas Badisa Rhythm: Kalyan, Trumpets & Trombone: Babu Ding Dong Music: Devi Sri Prasad Singers: Rahul Sipligunj & Malathi Lyrics: Kasarla Shyam Keyboards: KP, Keyboards: Vikas Badisa, Rhythm: Kalyan, Live Rhythms: Laxmi Narayana & Raju, Shehnai: Balesh, Frets & Guitars: Subhani ,Trumpets & Trombone: Babu Chorus: Anirudh Sushwaram, Sudharsan Ramakrishnan, Ashwin, Tanuj Menon, Sony, Anu Anand, Srisha Vijayasekhar, Srinisha Jayaseelan ,Chorus conducted by J Chittey Prakash Rao Set"Rechipodham" as Caller Tune Airtel user dial "5432116719576" Idea user dial "5678910876115" BSNL user dial "56710876115" Set"Entho Fun" as Caller Tune Airtel user dial "5432116725517" Idea user dial "5678910888495" BSNL user dial "56710888495" Set"Dhan Dhan" as Caller Tune Airtel user dial "5432116737305" Idea user dial "5678910909519" BSNL user dial "56710909519 Set"Ding Dong" as Caller Tune Airtel user dial "5432116737427" Idea user dial "5678910909498" BSNL user dial "56710909498" Set"Honey Is The Best" as Caller Tune Airtel user dial "5432116737462" Idea user dial "5678910909497" BSNL user dial "56710909497" Set "Girra Girra" as Caller Tune Airtel user dial "5432116737716" Idea user dial "5678910909518" BSNL user dial "56710909518" ------------------------------------------------------------------------------------------ Enjoy and stay connected with us!! ►Subscribe us on Youtube: http://bit.ly/adityamusic ►Like us on Facebook: http://www.facebook.com/adityamusic ►Follow us on Twitter: http://www.twitter.com/adityamusic ►Follow us on Instagram: https://www.instagram.com/adityamusicindia ►Follow us on LinkedIn: http://bit.ly/2Pp6ze3 ►Circle us: https://plus.google.com/+adityamusic SUBSCRIBE Aditya Music Channels for unlimited entertainment: ►For New Movies in HD: http://www.youtube.com/Adityamovies ►For Songs with Lyrics: https://www.youtube.com/AdityaMusicNM... ►For Devotional Songs: http://www.youtube.com/AdityaDevotional ►For Kids Educational: http://www.youtube.com/AdityaKids →"మా పాట మీ నోట" Telugu Lyrical Songs - http://bit.ly/1B2EcJG →Latest Tollywood Lyric Video Songs - http://bit.ly/1Km97mg →Ever Green Classics - https://goo.gl/1fZEDy →Popular Jukeboxes - https://goo.gl/LNvAIo →Telugu Songs with Lyrics - https://goo.gl/7ZmgWT © 2018 Aditya Music India Pvt. 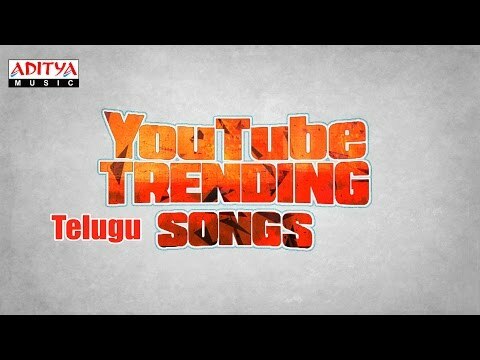 Ltd.
Watch & Enjoy Most Viewed Telugu Songs on Youtube. Don't forget to hit Like & share. Click here to Share on Facebook- http://bit.ly/2hC26aW ----------------------------------------------------------------------------------------- Enjoy and stay connected with us!! ►Subscribe us on Youtube: http://bit.ly/adityamusic ►Like us: http://www.facebook.com/adityamusic ►Follow us: http://www.twitter.com/adityamusic ►Circle us: https://plus.google.com/+adityamusic SUBSCRIBE Aditya Music Channels for unlimited entertainment: ►For New Movies in HD: http://www.youtube.com/Adityamovies ►For Songs with Lyrics: https://www.youtube.com/AdityaMusicNM... ►For Devotional Songs: http://www.youtube.com/AdityaDevotional ►For Kids Educational: http://www.youtube.com/AdityaKids →"మా పాట మీ నోట" Telugu Lyrical Songs - http://bit.ly/1B2EcJG →Latest Tollywood Lyric Video Songs - http://bit.ly/1Km97mg →Ever Green Classics - https://goo.gl/1fZEDy →Popular Jukeboxes - https://goo.gl/LNvAIo →Telugu Songs with Lyrics - https://goo.gl/7ZmgWT © 2016 Aditya Music India Pvt. Ltd. Listen & Enjoy Bodyguard Movie Song With Lyrics - Hosannaa (Aditya Music) - Venkatesh, Trisha Krishnan Subscribe to our Youtube Channel - http://goo.gl/tVbmAU Enjoy and stay connected with us!! Like us: http://www.facebook.com/adityamusic Follow us : http://www.twitter.com/adityamusic Circle us : https://plus.google.com/+adityamusic SUBSCRIBE Aditya Music Channels for unlimited entertainment : Aditya Movies : http://www.youtube.com/Adityamovies Aditya MusicnMovies : https://www.youtube.com/AdityaMusicNMovies Aditya Devotional : http://www.youtube.com/AdityaDevotional Aditya Kids : http://www.youtube.com/AdityaKids Director : Gopichand Malineni Producer : Bellamkonda Suresh Music Director : Thaman S Lyricist : Bhaskara Bhatla, Ananth Sriram, Srimani, Ramajogaya Sastry. Cast : Venkatesh, Trisha Krishnan, Saloni Aswani, Prakash Raj, Kota Srinivasan Rao, Ali, Subbaraju, Dharmavarapu Subramanyam, Pragathy. .
Watch & Enjoy Chandamame Full Video Song From 118 Movie. 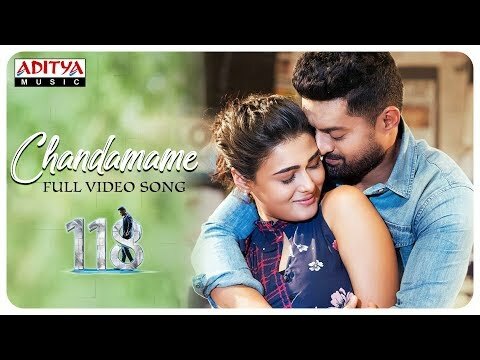 #118Movie #Chandamame #NandamuriKalyanRam Click here to share on Facebook- https://goo.gl/wtCmD9 Listen on AppleMusic- https://goo.gl/a7vD6S Audio also available on: JioSaavn- https://goo.gl/hngS9c Wynk- https://goo.gl/pruRzE Gaana- https://goo.gl/fP3tHF Spotify- https://goo.gl/3Zsm4M Amazon Music- https://goo.gl/En3DUA Song: Chandamame Movie: 118 Director, Story, Cinematography : Guhan K.V. Producer: Mahesh S Koneru Music: Shekhar Chandra Singer: Yazin nizar Lyrics: Ram anjaneyalu Editing: Thammiraju Action: Anbariv, Venkat, Real Sateesh Dialogues: Mirchi Kiran, V. Srinivas Banner: East Coast Productions Music Label: Aditya Music. Set "Chandamame" as Caller Tune Airtel user dial "5432116802041" Idea user dial "5678911018655" BSNL user dial "56711018655" ------------------------------------------------------------------------------------------ Enjoy and stay connected with us!! ►Subscribe us on Youtube: http://bit.ly/adityamusic ►Like us on Facebook: http://www.facebook.com/adityamusic ►Follow us on Twitter: http://www.twitter.com/adityamusic ►Follow us on Instagram: https://www.instagram.com/adityamusicindia ►Follow us on LinkedIn: http://bit.ly/2Pp6ze3 ►Circle us: https://plus.google.com/+adityamusic SUBSCRIBE Aditya Music Channels for unlimited entertainment: ►For New Movies in HD: http://www.youtube.com/Adityamovies ►For Songs with Lyrics: https://www.youtube.com/AdityaMusic ►For Devotional Songs: http://www.youtube.com/AdityaDevotional ►For Kids Educational: http://www.youtube.com/AdityaKids →"మా పాట మీ నోట" Telugu Lyrical Songs - http://bit.ly/1B2EcJG →Latest Tollywood Lyric Video Songs - http://bit.ly/1Km97mg →Ever Green Classics - https://goo.gl/1fZEDy →Popular Jukeboxes - https://goo.gl/LNvAIo →Telugu Songs with Lyrics - https://goo.gl/7ZmgWT © 2019 Aditya Music India Pvt. Ltd.
Watch & Enjoy #HoneyisTheBest Full Video Song From #F2 Movie Starring #Venkatesh & #VarunTej, #Mehreen, #Tamannah, Directed by #AnilRavipudi & Music Composed by #DeviSriPrasad and Produced by Shirish- Laxman, Under the Production Of Sri Venkateswara Creations. Click here to share on Facebook- https://goo.gl/kxfKVg Listen on AppleMusic- https://goo.gl/ZqsNtL Audio also available on: JioSaavn- https://goo.gl/XcP6Kr Wynk- https://goo.gl/uxWnqM AmazonMusic- https://goo.gl/dwkLAE Gaana- https://goo.gl/aCFKWs Spotify- https://goo.gl/RiuMWe Song : Honey Is The Best Movie : F2 Banner: Sri Venkateswara Creations Producers : Shirish- Laxman Director: AnilRavipudi Music : DSP Lyrics: Shreemani Singer: Hariharasudhan Starring : Venkatesh, Varun Tej,Tamannah, Mehreen Cinematography : Sameer Reddy PRO : Vamsi Kaka Digital Media : Nani Music Label : Aditya Music. Set"Honey Is The Best" as Caller Tune Airtel user dial "5432116737462" Idea user dial "5678910909497" BSNL user dial "56710909497" ------------------------------------------------------------------------------------------------------------------------------------------------------- Enjoy and stay connected with us!! ►Subscribe us on Youtube: http://bit.ly/adityamusic ►Like us on Facebook: http://www.facebook.com/adityamusic ►Follow us on Twitter: http://www.twitter.com/adityamusic ►Follow us on Instagram: https://www.instagram.com/adityamusicindia ►Follow us on LinkedIn: http://bit.ly/2Pp6ze3 ►Circle us: https://plus.google.com/+adityamusic SUBSCRIBE Aditya Music Channels for unlimited entertainment: ►For New Movies in HD: http://www.youtube.com/Adityamovies ►For Songs with Lyrics: https://www.youtube.com/AdityaMusic ►For Devotional Songs: http://www.youtube.com/AdityaDevotional ►For Kids Educational: http://www.youtube.com/AdityaKids →"మా పాట మీ నోట" Telugu Lyrical Songs - http://bit.ly/1B2EcJG →Latest Tollywood Lyric Video Songs - http://bit.ly/1Km97mg →Ever Green Classics - https://goo.gl/1fZEDy →Popular Jukeboxes - https://goo.gl/LNvAIo →Telugu Songs with Lyrics - https://goo.gl/7ZmgWT © 2019 Aditya Music India Pvt. 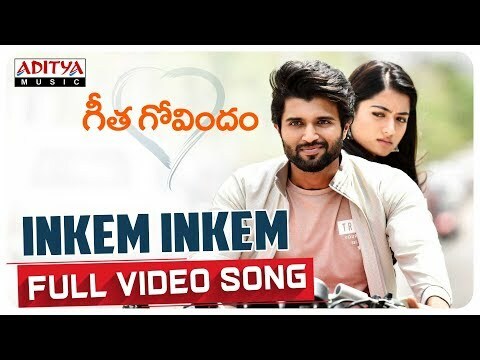 Ltd.
Watch & Enjoy #InkemInkem Full Video Song From Telugu Movie #GeethaGovindam. Starring #VijayDevarakonda #RashmikaMandanna. Music Composed by Gopi Sundar, Produced by Bunny Vas and Directed by Parasuram, Under the banner of GA2 Pictures. Click here to share on Facebook- https://goo.gl/mUU4R4 Listen on Apple Music- https://goo.gl/1iPDXB Audio also available on: JioSaavn- https://goo.gl/Uuzuq3 Gaana- https://goo.gl/V9NW8M Wynk- https://goo.gl/Ft1umL Spotify- https://goo.gl/QBZLiJ Song: Inkem Inkem Movie: Geetha Govindam Banner: GA2 Pictures Producer: Bunny Vas Director: Parasuram Music: Gopi Sundar Lyrics: Ananta Sriram Singer: Sid Sriram Cast: Vijay Devarakonda, RashmikaMandanna Song Composed, Arranged & Programmed By: Gopi Sundar studio Backing Vocals: Divya S Menon, Ajay Sathyan, Gopi Sundar Guitar & Bass: Sumesh Parameswar Veena: Biju Music Production Manager: Babu V K Songs Recorded at: Sunsa Digital Work Station, Chennai & Cochin Engineered by: Midhun Anand, Krishnal BS, Nikhil Mathews, Gopi Sundar Song Mixed & Masters By: Shadab Rayeen Sound Enginer: K Narendra Studio: Euphony Classic Digital Studio Coridinator: A N Basha Conductor: V Srikrishna Choreographer: Viswa Raghu Editor: Marthand K Venkatesh DOP: Manikandan Music Label: Aditya Music. Set "Inkem Inkem Inkem Kaavaale" as Caller Tune Airtel user dial "5432116553455" Idea user dial "5678910547440" BSNL user dial "56710547440" Set "Geetha Govindam" as Caller Tune Airtel user dial "5432116553387" Idea user dial "5678910547441" BSNL user dial "56710547441" ----------------------------------------------------------------------------------------------------------- Enjoy and stay connected with us!! ►Subscribe us on Youtube: http://bit.ly/adityamusic ►Like us: http://www.facebook.com/adityamusic ►Follow us: http://www.twitter.com/adityamusic ►Circle us: https://plus.google.com/+adityamusic SUBSCRIBE Aditya Music Channels for unlimited entertainment: ►For New Movies in HD: http://www.youtube.com/Adityamovies ►For Songs with Lyrics: https://www.youtube.com/AdityaMusicNM... ►For Devotional Songs: http://www.youtube.com/AdityaDevotional ►For Kids Educational: http://www.youtube.com/AdityaKids →"మా పాట మీ నోట" Telugu Lyrical Songs - http://bit.ly/1B2EcJG →Latest Tollywood Lyric Video Songs - http://bit.ly/1Km97mg →Ever Green Classics - https://goo.gl/1fZEDy →Popular Jukeboxes - https://goo.gl/LNvAIo →Telugu Songs with Lyrics - https://goo.gl/7ZmgWT © 2018 Aditya Music India Pvt. 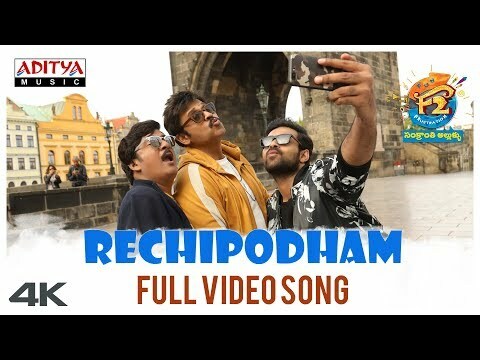 Ltd.
Watch & Enjoy #RechipodhamBrother Full Video Song From #F2 Movie. Starring #Venkatesh & #VarunTej. Directed by #AnilRavipudi & Music Composed by #DeviSriPrasad, Produced by Shirish-Laxman, Under the Production Of Sri Venkateswara Creations. Click here to share on Facebook- https://goo.gl/s3YyCq Listen on Apple Music- https://goo.gl/SvB2DD Audio also available on: JioSaavn- https://goo.gl/Z3qJzU Wynk- https://goo.gl/PMkaMY Gaana- https://goo.gl/aCFKWs AmazonMusic- https://goo.gl/CqaPqc Spotify- https://goo.gl/WcC4SV Song Name : Rechipodham Brother Movie : F2 Banner: Sri Venkateswara Creations Producers : Shirish- Laxman Director: AnilRavipudi Music : DSP Lyrics : Kasarla Shyam Singer : David Simon Keyboards: Vikas Badisa Rhythm: Kalyan Harmony: Sony, Anu Anand, Srisha Vijaysekar, Srinisha Jayaseelan Harmony conducted by J Chitty Prakash Rao PRO : Vamsi Kaka Digital Media : Nani Music Label: Aditya Music. Set " Rechhipodam Brother " as Caller Tune Airtel user Dial "5432116719576" Idea user Dial "5678910876115" BSNL user Dial "56710876115" ------------------------------------------------------------------------------------------ Enjoy and stay connected with us!! ►Subscribe us on Youtube: http://bit.ly/adityamusic ►Like us on Facebook: http://www.facebook.com/adityamusic ►Follow us on Twitter: http://www.twitter.com/adityamusic ►Follow us on Instagram: https://www.instagram.com/adityamusicindia ►Follow us on LinkedIn: http://bit.ly/2Pp6ze3 ►Circle us: https://plus.google.com/+adityamusic SUBSCRIBE Aditya Music Channels for unlimited entertainment: ►For New Movies in HD: http://www.youtube.com/Adityamovies ►For Songs with Lyrics: https://www.youtube.com/AdityaMusic ►For Devotional Songs: http://www.youtube.com/AdityaDevotional ►For Kids Educational: http://www.youtube.com/AdityaKids →"మా పాట మీ నోట" Telugu Lyrical Songs - http://bit.ly/1B2EcJG →Latest Tollywood Lyric Video Songs - http://bit.ly/1Km97mg →Ever Green Classics - https://goo.gl/1fZEDy →Popular Jukeboxes - https://goo.gl/LNvAIo →Telugu Songs with Lyrics - https://goo.gl/7ZmgWT © 2019 Aditya Music India Pvt. Ltd. 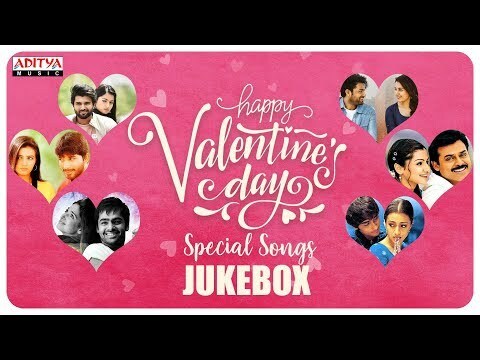 Listen & Enjoy #Valentinesday Special Love Songs Jukebox. Don’t Forget to Hit Like & Share!! ♫♫Songs♫♫ 00:04- Inkem Inkem Inkem Kaavaale 04:31- Undiporaadhey 07:24- Naa Chupe Ninu 11:38- Feel My Love 16:37- Meghaalu Lekunna 21:37- Idhedho Bagundhe 26:03- Nanu Neetho 30:39- Aaraduguluntada 34:43- Emaindhi Eevela 40:03- Violin Song 44:27- Niluvaddham 50:24- Nee Jathaga 54:59- Nee Choopule 01:00:59- Ninnu Chudagane 01:04:52- Toliprema Song: Inkem Inkem Inkem Kaavaale Movie: Geetha Govindam Music: Gopi Sundar Lyrics: Ananta Sriram Singer: Sid Sriram Song: Undiporaadhey Movie: Hushaaru Music: Radhan Lyrics: Kittu Vissapragada Singer: Sid Sriram Song: Naa Chupe Ninu Movie: Nuvvu Naaku Nachchav Music: Koti Lyrics: Sirivennela Sitarama Sastry Singers: Chitra, Sriram, Prabhu Song: Feel My Love Movie: Aarya Music: Devi Sri Prasad Lyrics: Chandra Bose Singer: K.K Song: Meghaalu Lekunna Movie: Kumari 21 F Music: Devi Sri Prasad Lyrics: Sree Mani, Anantha Sriram Singer: Yazin Nizar Song: Idhedho Bagundhe Movie: Mirchi Music: Devi Sri Prasad Lyrics: Ramajogayya Sastry Singer: Vijay Prakash Song: Nanu Neetho Movie: Gundello Godari Music: Ilaiyaraaja Lyrics: Anantha Sriram Singer: Bhavatharini Song: Aaraduguluntada Movie: Seethamma Vakitlo Sirimalle Chettu Music: Mickey.J.Mayor Lyrics: Anantha Sriram Singer: Kalyani Song: Emaindhi Eevela Movie: Aadavari Matalaku Ardhalu Veruley Music: Yuvan Shankar Raja Lyrics: Kula Sekhar Singer: Udit Narayan Song: Violin Song Movie: Idharammayilatho Music: Devi Sri Prasad Lyrics: Viswa, David Simon Singers: David Simon, Anitha Song: Niluvaddham Movie: Nuvvostanante Nenoddantana Music: Devi Sri Prasad Lyrics: Sirivennela Sitarama Sastry Singers: Karthik, Sumangali Song: Nee Jathaga Movie: Yevadu Music: Devi Sri Prasad Lyrics: Sirivennela Sitarama Sastry Singers: Karthik, Shreya Ghoshal Song: Nee Choopule Movie: Endukante Premanta Music: G.V.Prakash Kumar Lyrics: Ramajogayya Sastry Singers: Haricharan, Chitra Song: Ninnu Chudagane Movie: Loukyam Music: Anoop Rubens Lyrics: Anantha Sriram Singers: Vijay Prakash, Mohana Song: Toliprema Movie: Tholi Prema Music: Thaman S Lyrics: Srimani Singer: Kaala Bhairava ------------------------------------------------------------------------------------------ Enjoy and stay connected with us!! ►Subscribe us on Youtube: http://bit.ly/adityamusic ►Like us on Facebook: http://www.facebook.com/adityamusic ►Follow us on Twitter: http://www.twitter.com/adityamusic ►Follow us on Instagram: https://www.instagram.com/adityamusicindia ►Follow us on LinkedIn: http://bit.ly/2Pp6ze3 ►Circle us: https://plus.google.com/+adityamusic SUBSCRIBE Aditya Music Channels for unlimited entertainment: ►For New Movies in HD: http://www.youtube.com/Adityamovies ►For Songs with Lyrics: https://www.youtube.com/AdityaMusic ►For Devotional Songs: http://www.youtube.com/AdityaDevotional ►For Kids Educational: http://www.youtube.com/AdityaKids →"మా పాట మీ నోట" Telugu Lyrical Songs - http://bit.ly/1B2EcJG →Latest Tollywood Lyric Video Songs - http://bit.ly/1Km97mg →Ever Green Classics - https://goo.gl/1fZEDy →Popular Jukeboxes - https://goo.gl/LNvAIo →Telugu Songs with Lyrics - https://goo.gl/7ZmgWT © 2019 Aditya Music India Pvt. Ltd.
Watch & Enjoy #Guruvaram Full Video Song From #KirrakParty Movie. Starring #NikhilSiddharth, #Samyuktha, #SimranPareenja. Music composed by B. Ajaneesh Lokanath, Directed by #SharanKoppisetty and Produced by Ramabrahmam Sunkara under the banner of AK Entertainments. 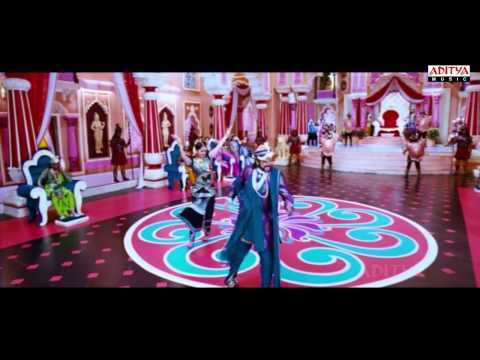 Click here to Share on Facebook- https://goo.gl/tszb93 Listen on Apple Music- https://goo.gl/v47pwQ Audio also available on: JioSaavn- https://goo.gl/on3zF4 Wynk- https://goo.gl/zrgf2i Gaana- https://goo.gl/7m1m6W Spotify- https://goo.gl/XYXSmr Song Name : Guruvaram Movie: Kirrak Party Production: AK Entertainments Producer: Ramabrahmam Sunkara Director: Sharan Koppisetty Cast : Nikhil Siddharth , Samyuktha, Simran Pareenja Music: B. Ajaneesh Lokanath Lyrics : Rakendu Mouli Singer : Vijay Prakash Cinematography : Advaitha Guru Murthy Screen play : Sudheer Varma Dialogues : Chandoo Mondeti Music Label: Aditya Music. Set “Guruvaram” as Caller Tune Airtel user dial “5432116493618” Idea user dial “5678910296172” BSNL user dial “56710296172” ------------------------------------------------------------------------------------------ Enjoy and stay connected with us!! ►Subscribe us on Youtube: http://bit.ly/adityamusic ►Like us: http://www.facebook.com/adityamusic ►Follow us: http://www.twitter.com/adityamusic ►Circle us: https://plus.google.com/+adityamusic SUBSCRIBE Aditya Music Channels for unlimited entertainment: ►For New Movies in HD: http://www.youtube.com/Adityamovies ►For Songs with Lyrics: https://www.youtube.com/AdityaMusicNM... ►For Devotional Songs: http://www.youtube.com/AdityaDevotional ►For Kids Educational: http://www.youtube.com/AdityaKids →"మా పాట మీ నోట" Telugu Lyrical Songs - http://bit.ly/1B2EcJG →Latest Tollywood Lyric Video Songs - http://bit.ly/1Km97mg →Ever Green Classics - https://goo.gl/1fZEDy →Popular Jukeboxes - https://goo.gl/LNvAIo →Telugu Songs with Lyrics - https://goo.gl/7ZmgWT © 2018 Aditya Music India Pvt. Ltd.
Watch & Enjoy Chandamame Lyrical From 118 Movie. 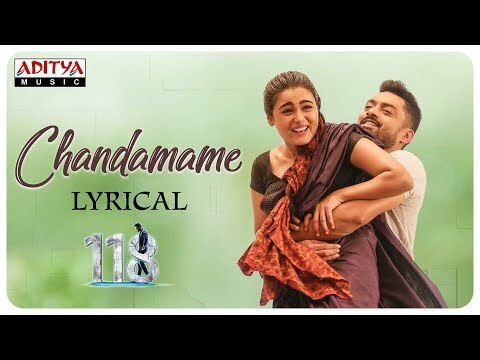 #118Movie #Chandamame #NandamuriKalyanRam Click here to share on Facebook- https://goo.gl/n9X1mB Listen on AppleMusic- https://goo.gl/4MdC3P Audio also available on: JioSaavn- https://goo.gl/hngS9c Wynk- https://goo.gl/N2f8Wm Gaana- https://goo.gl/fP3tHF Spotify- https://goo.gl/3Zsm4M Amazon Music- https://goo.gl/En3DUA Song: Chandamame Movie: 118 Director, Story, Cinematography : Guhan K.V. Producer: Mahesh S Koneru Music: Shekhar Chandra Singer: Yazin nizar Lyrics: Ram anjaneyalu Editing: Thammiraju Action: Anbariv, Venkat, Real Sateesh Dialogues: Mirchi Kiran, V. Srinivas Banner: East Coast Productions Music Label: Aditya Music. Set "Chandamame" as Caller Tune Airtel user dial "5432116802041" Idea user dial "5678911018655" BSNL user dial "56711018655" ------------------------------------------------------------------------------------------ Enjoy and stay connected with us!! ►Subscribe us on Youtube: http://bit.ly/adityamusic ►Like us on Facebook: http://www.facebook.com/adityamusic ►Follow us on Twitter: http://www.twitter.com/adityamusic ►Follow us on Instagram: https://www.instagram.com/adityamusicindia ►Follow us on LinkedIn: http://bit.ly/2Pp6ze3 ►Circle us: https://plus.google.com/+adityamusic SUBSCRIBE Aditya Music Channels for unlimited entertainment: ►For New Movies in HD: http://www.youtube.com/Adityamovies ►For Songs with Lyrics: https://www.youtube.com/AdityaMusic ►For Devotional Songs: http://www.youtube.com/AdityaDevotional ►For Kids Educational: http://www.youtube.com/AdityaKids →"మా పాట మీ నోట" Telugu Lyrical Songs - http://bit.ly/1B2EcJG →Latest Tollywood Lyric Video Songs - http://bit.ly/1Km97mg →Ever Green Classics - https://goo.gl/1fZEDy →Popular Jukeboxes - https://goo.gl/LNvAIo →Telugu Songs with Lyrics - https://goo.gl/7ZmgWT © 2019 Aditya Music India Pvt. Ltd. 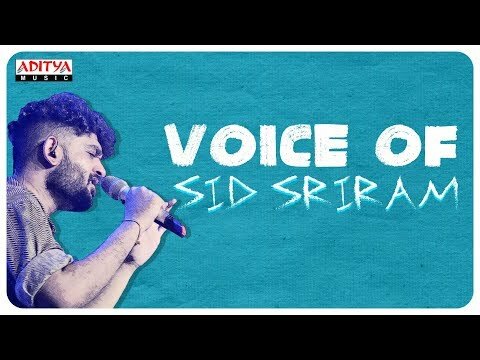 Listen & Enjoy Voice of Sid Sriram Latest Hit Songs Jukebox Vol.1. Don't Forget to Hit Like & Share!! Click here to share on Facebook- https://goo.gl/sQjZqo ♫♫Songs♫♫ 00:04- Maate Vinadhuga 04:35- Undiporaadhey 07:30- Emo Emo Emo 11:55- Egiregire 15:06- Vachindamma 19:15- Inkem Inkem Inkem Kaavaale 23:41- Vellipomakey Song: Maate Vinadhuga Movie: Taxiwaala Music: Jakes Bejoy Lyrics: Krishna Kanth Singer: Sid Sriram Song: Undiporaadhey Movie: Hushaaru Music: Radhan Lyrics: Kittu Vissapragada Singer: Sid Sriram Song: Emo Emo Emo Movie: Devadas Music: Manisharma Lyrics: Sirivennela Seetharama Sastry Singers: Sid Sriram, Ramya Behara Song: Egiregire Movie: Shailaja Reddy Alludu Music: Gopi Sundar Lyrics: Krishna Kanth (K.K) Singers: Sid Sriram, Lipsika Song: Vachindamma Movie: Geetha Govindam Music: Gopi Sundar Lyrics: Sri Mani Singer: Sid Sriram Song: Inkem Inkem Inkem Kaavaale Movie: Geetha Govindam Music: Gopi Sundar Lyrics: Ananta Sriram Singer: Sid Sriram Song: Vellipomaake Movie: Saahasam Swaasaga Saagipo Music: A R Rahman Lyrics: Sreejo Singers: Sid Sriram, ADK -------------------------------------------------------------------------------------------------------------------------------------------------------- Enjoy and stay connected with us!! ►Subscribe us on Youtube: http://bit.ly/adityamusic ►Like us on Facebbok: http://www.facebook.com/adityamusic ►Follow us on Twitter: http://www.twitter.com/adityamusic ►Follow us on Instagram: https://www.instagram.com/adityamusicindia ►Follow us on LinkedIn: http://bit.ly/2Pp6ze3 ►Circle us: https://plus.google.com/+adityamusic SUBSCRIBE Aditya Music Channels for unlimited entertainment: ►For New Movies in HD: http://www.youtube.com/Adityamovies ►For Songs with Lyrics: https://www.youtube.com/AdityaMusicNM... ►For Devotional Songs: http://www.youtube.com/AdityaDevotional ►For Kids Educational: http://www.youtube.com/AdityaKids →"మా పాట మీ నోట" Telugu Lyrical Songs - http://bit.ly/1B2EcJG →Latest Tollywood Lyric Video Songs - http://bit.ly/1Km97mg →Ever Green Classics - https://goo.gl/1fZEDy →Popular Jukeboxes - https://goo.gl/LNvAIo →Telugu Songs with Lyrics - https://goo.gl/7ZmgWT © 2018 Aditya Music India Pvt. Ltd.
Aditya Music Presents Pleasant Telugu Hit Songs Jukebox (VOL- 1) from Various Hit Movies. ♫►Pleasant Telugu Hit Songs ( Vol 1)◄♫ 00:32 - Edhuta Nilichindhi ----- Vaana 05:00 - Chali Chaliga ----- Mr Perfect 11:19 - Neeti Mullai (Bit) -----Varsham 16:48 - Oke Oka Mata ----- Chakram 20:42 - Nee Kallathoti ----- Thulasi 25:19 - Thalachithalachi(Female) ----- 7G Brundhavana Colony 30:27 - Ye Swasalo ----- Nenunnanu 35:03 - Telusuna ----- Sontham 40:37 - Nuvvu Nuvvu ----- Khadgam 47:04 - Mellaga Mellaga-Female ----- Asha Asha Asha 51:58 - Edo Edo ----- Nuvvu Leka Nenu Lenu ----------------------------------------­­­­­­--------------------- Enjoy and stay connected with us!! ►Subscribe us on Youtube :http://bit.ly/adityamusic ►Like us: http://www.facebook.com/adityamusic ►Follow us : http://www.twitter.com/adityamusic ►Circle us : https://plus.google.com/+adityamusic SUBSCRIBE Aditya Music Channels for unlimited entertainment : ►For New Movies in HD : http://www.youtube.com/Adityamovies ►For Songs with Lyrics : https://www.youtube.com/AdityaMusicNM... ►For Devotional Songs : http://www.youtube.com/AdityaDevotional ►For Kids Educational : http://www.youtube.com/AdityaKids →"మా పాట మీ నోట" Telugu Lyrical Songs - http://bit.ly/1B2EcJG →Latest Tollywood Lyric Video Songs - http://bit.ly/1Km97mg →Ever Green Classics - https://goo.gl/1fZEDy →Popular Jukeboxes - https://goo.gl/LNvAIo →Telugu Songs with Lyrics - https://goo.gl/7ZmgWT © 2015 Aditya Music India Pvt. Ltd. Listen & Enjoy Maestro Ilayaraja Classical Hit Songs. Hit Like & Do Comment your favorite song. Click Here to Share on Facebook- http://on.fb.me/1CKCooc ♫Songs♫ 00:00 :: Prema Entha//Abhinandana 04:08 :: Premaledani//Abhinandana 08:41 :: Jabilli Kosam-Male//Manchi Manasulu 13:08 :: Priyathama//Prema 18:58 :: Manishiko Sneham//Aathma Bandhuvu 23:21 :: O Papa Lali//Geetanjali 27:48 :: Chukkalle Thochave//Nereekshana 32:13 :: Vatapatra (Sad)//Swati Mutyam 33:17 :: O Prema Na Prema - Male//Chanti-Old 36:18 :: Eduta Neeve//Abhinandana 40:33 :: Nenoka Sindhu//Sindhu Bairavi 45:27 :: Nee Guduchedirindi//Nayakudu 47:00 :: Cheppalani//Rudra Veena 53:46 :: Dhamarukamu Mroga//Manchi Manasulu 58:29 :: Karpura Bomma//O Papa Lali 01:03:24 :: Puchi Brahma//Guna 01:08:08 :: Priyatham -Sad//Priyathama 01:11:29 :: Edalo Laya//Anveshana 01:18:43 :: O Priya//Geetanjali 01:24:27 :: O Prema Na Prema - Female//Chanti-Old 01:29:33 :: Yamunna Thatilo ( Sad )//Dalapathi 01:31:21 :: Kalushitham//Keechurallu 01:34:17 :: Ade Neevu//Abhinandana 01:38:47 :: Ye Navade Teramo//Sankeerthana 01:43:14 :: Navodayam//Kokila-Old 01:47:54 :: Moogaina Hridayama//Aathma Bandhuvu 01:52:17 :: Aavedhana//Aalapana 01:55:42 :: Chukkalanti (Sad)//Abhinandana 01:57:47 :: Padalenu//Sindhu Bairavi 02:03:05 :: Maanava Seva//Rudra Veena 02:08:47 :: Emauthundhi//Aaradhana 02:13:22 :: Theeganai Mallenai//Aaradhana 02:17:44 :: Ada Janmaku//Dalapathi 02:20:42 :: Gali Ningi Neeru//Sri Rama Rajyam 02:25:17 :: Kalaya Nijama//Sri Rama Rajyam 02:27:10 :: Poomala//Sindhu Bairavi 02:31:45 :: Lali Jo Lali Jo//Indhrudu Chandhrudu 02:36:32 :: Kalala//Sri Kanaka Mahalakshmi Recording Dance Troope 02:41:24 :: Dhamarukamu Mroga//Manchi Manasulu 02:47:06 :: Unna Nekorake//Guna 02:51:14 :: Maa Kanti//Swathi Chinukulu 02:55:55 :: Regutunna Dhoka//Dance Master 03:00:38 :: Dharmam//Swati Mutyam 03:03:27 :: Pavuraniki Panjaraniki//Chanti-Old 03:08:13 :: Sindhurapu Puthotalo//Killer 03:13:08 :: Chinni Padala//Preminchedi Endukamma 03:18:12 :: Edo Mounaragam//Ninuchoodaka Nenundalenu 03:23:07 :: Neeti Meedha//Shiv Shankar 03:28:06 :: Pranama Na Pranama//Sunny 03:31:10 :: Punyamu Kori//Kashinath 03:34:38END ----------------------------------------------------------------------------------------- Enjoy and stay connected with us!! ►Subscribe us on Youtube: http://bit.ly/adityamusic ►Like us: http://www.facebook.com/adityamusic ►Follow us: http://www.twitter.com/adityamusic ►Circle us: https://plus.google.com/+adityamusic SUBSCRIBE Aditya Music Channels for unlimited entertainment: ►For New Movies in HD: http://www.youtube.com/Adityamovies ►For Songs with Lyrics: https://www.youtube.com/AdityaMusicNM... ►For Devotional Songs: http://www.youtube.com/AdityaDevotional ►For Kids Educational: http://www.youtube.com/AdityaKids →"మా పాట మీ నోట" Telugu Lyrical Songs - http://bit.ly/1B2EcJG →Latest Tollywood Lyric Video Songs - http://bit.ly/1Km97mg →Ever Green Classics - https://goo.gl/1fZEDy →Popular Jukeboxes - https://goo.gl/LNvAIo →Telugu Songs with Lyrics - https://goo.gl/7ZmgWT © 2016 Aditya Music India Pvt. 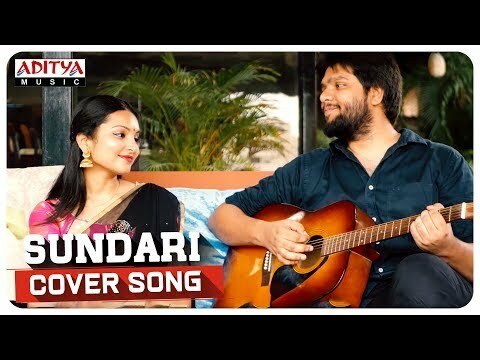 Ltd.
Watch & Enjoy #Sundari Cover Song Click here to share on Facebook- https://bit.ly/2VaxH6J Singers :Raghuram & Lakshmi Sruthi Guitars : Joel Violin : pavan Mixed by : Raghuram at TL studios Originally Composed by Ilayaraja Sung by SPB & Chitra Song : Sundari Movie : Michael Madana Kamaraju Banner : Sri Lakshmi Bhavani Creations Producer : Mandava Krishna Chand Director : Singeetam Srinivasa Rao Music Director : Ilayaraja Lyrics : Rajasri Star Cast : Kamal Hasan, Kushbu, Urvashi Music Label : Aditya Music. ------------------------------------------------------------------------------------------ Enjoy and stay connected with us!! ►Subscribe us on Youtube: http://bit.ly/adityamusic ►Like us on Facebook: http://www.facebook.com/adityamusic ►Follow us on Twitter: http://www.twitter.com/adityamusic ►Follow us on Instagram: https://www.instagram.com/adityamusicindia ►Follow us on LinkedIn: http://bit.ly/2Pp6ze3 ►Circle us: https://plus.google.com/+adityamusic SUBSCRIBE Aditya Music Channels for unlimited entertainment: ►For New Movies in HD: http://www.youtube.com/Adityamovies ►For Songs with Lyrics: https://www.youtube.com/AdityaMusic ►For Devotional Songs: http://www.youtube.com/AdityaDevotional ►For Kids Educational: http://www.youtube.com/AdityaKids →"మా పాట మీ నోట" Telugu Lyrical Songs - http://bit.ly/1B2EcJG →Latest Tollywood Lyric Video Songs - http://bit.ly/1Km97mg →Ever Green Classics - https://goo.gl/1fZEDy →Popular Jukeboxes - https://goo.gl/LNvAIo →Telugu Songs with Lyrics - https://goo.gl/7ZmgWT © 2019 Aditya Music India Pvt. Ltd. 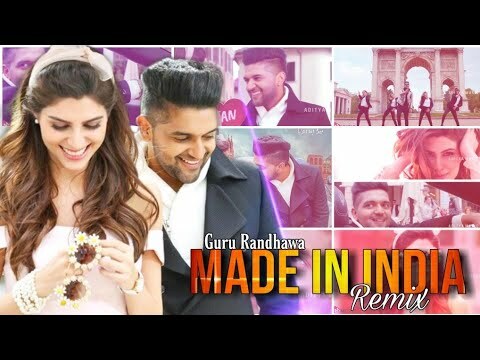 Enjoy And Stay Connected With Us... ♥ LIKE | SHARE | SPREAD LOVE ♥ #Made_In_India #DJ_REMIX #ADITYA_MUSIC Credits:- Song - Made In India Singer- Guru Randhawa Music Composer- Guru Randhawa Lyrics - Guru Randhawa Music Producer - Vee Video Directed By - DirectorGifty MUSIC_LABEL:-ADITYA_MUSIC ●●●●●●●●●●●●●●●●●●●●●●●●●●●●●●● Re-Created By:- Aditya Music ◆◆◆◆◆◆◆◆◆◆◆◆◆◆◆◆◆◆◆◆◆◆◆◆◆ ♥ LIKE | SHARE | SPREAD LOVE ♥ All rights with original song creators.We do not intend want copyright infringement. *DISCLAIMER: This Following Audio/Video is Strictly meant for Promotional Purpose. We Do not Wish to make any Commercial Use of this & Intended to Showcase the Creativity Of the Artist Involved. * *The original Copyright(s) is (are) Solely owned by the Companies/Original-Artist(s)/Record-label(s). All the contents are intended to Showcase the creativity of theArtist involved and is strictly done for promotional purpose. * Thanks For stay here's If you Enjoyed Then LIKE Subscribe Share with Friends💕💕 Enjoy & stay connected with us! 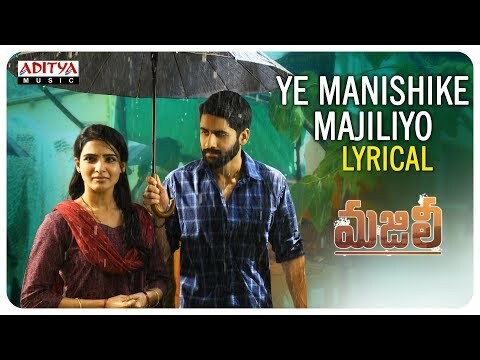 Watch & Enjoy Ye Manishike Majiliyo Lyrical From Majili Movie. #Majili #NagaChaitanya #Samantha Click here to share on Facebook- https://goo.gl/2bH8ME Audio also available on: Wynk- https://goo.gl/PVbYy9 JioSaavn- https://goo.gl/TCpxwS AmazonMusic- https://goo.gl/eHQk7C AppleMusic- https://goo.gl/UrVH1b Gaana- https://goo.gl/9eTHnm Spotify- https://goo.gl/nREHbP Song: Ye Manishike Majiliyo Movie : Majili Banner: Shine Screens Producers: Sahu Garapati and Harish Peddi Written & Direction: Shiva Nirvana Art Director : Sahi Suresh Music: Gopi Sunder Lyrics: Vanamali Singers : Arun Gopan, Chinmayi Sripada, Baby Anusha Cast: Naga Chaitanya, Samantha, Divyansha Kaushik, Rao Ramesh, Posani Krishna Murali, Subbaraju, Rajasri Nair DOP: Vishnu Sarma Editor: Prawin Pudi Music Production Manager : Babu Velayudhan Technical Support : Godson Kalappurakkal SONGS RECORDED @ : SUNSA DIGITAL WORKSTATION, CHENNAI & COCHIN. ENGINEERED BY : MIDHUN ANAND,KRISHNALAL.BS,NIKHIL MATHEWS,GOPI SUNDAR ALL SONGS MIXED AND MASTERED BY : MIDHUN ANAND @SUNSA DIGITAL WORKSTATION Music Label: Aditya Music. Set "Ye Manishike Majiliyo" as Caller Tune Airtel user dial "5432116876094" Vodafone user dial "53711146287" Idea user dial "5678911146287" BSNL user dial "56711146287" ------------------------------------------------------------------------------------------ Enjoy and stay connected with us!! ►Subscribe us on Youtube: http://bit.ly/adityamusic ►Like us on Facebook: http://www.facebook.com/adityamusic ►Follow us on Twitter: http://www.twitter.com/adityamusic ►Follow us on Instagram: https://www.instagram.com/adityamusicindia ►Follow us on LinkedIn: http://bit.ly/2Pp6ze3 ►Circle us: https://plus.google.com/+adityamusic SUBSCRIBE Aditya Music Channels for unlimited entertainment: ►For New Movies in HD: http://www.youtube.com/Adityamovies ►For Songs with Lyrics: https://www.youtube.com/AdityaMusic ►For Devotional Songs: http://www.youtube.com/AdityaDevotional ►For Kids Educational: http://www.youtube.com/AdityaKids →"మా పాట మీ నోట" Telugu Lyrical Songs - http://bit.ly/1B2EcJG →Latest Tollywood Lyric Video Songs - http://bit.ly/1Km97mg →Ever Green Classics - https://goo.gl/1fZEDy →Popular Jukeboxes - https://goo.gl/LNvAIo →Telugu Songs with Lyrics - https://goo.gl/7ZmgWT © 2019 Aditya Music India Pvt. Ltd.
Watch & Enjoy MAJILI Theatrical Trailer From The Movie Majili. #NagaChaitanya #Samantha #DivyanshaKaushik Click here to share on Facebook- https://bit.ly/2K51glC Audio also available on: Wynk- https://goo.gl/L6ZF2m JioSaavn- https://goo.gl/vVJihy AmazonMusic- https://goo.gl/YGXxzK AppleMusic- https://goo.gl/UrVH1b Gaana- https://goo.gl/rtwd6T Spotify- https://goo.gl/qnAUE4 Movie :Majili Banner: Shine Screens Producers: Sahu Garapati and Harish Peddi Story, Direction: Shiva Nirvana Music: Gopi Sunder Cast: Naga Chaitanya, Samantha, Divyansha Kaushik, Rao Ramesh, Posani Krishna Murali, Shatru, Rajasri Nair DOP: Vishnu Sarma Editor: Prawin Pudi Music Label: Aditya Music. ------------------------------------------------------------------------------------------ Enjoy and stay connected with us!! ►Subscribe us on Youtube: http://bit.ly/adityamusic ►Like us on Facebook: http://www.facebook.com/adityamusic ►Follow us on Twitter: http://www.twitter.com/adityamusic ►Follow us on Instagram: https://www.instagram.com/adityamusicindia ►Follow us on LinkedIn: http://bit.ly/2Pp6ze3 ►Circle us: https://plus.google.com/+adityamusic SUBSCRIBE Aditya Music Channels for unlimited entertainment: ►For New Movies in HD: http://www.youtube.com/Adityamovies ►For Songs with Lyrics: https://www.youtube.com/AdityaMusic ►For Devotional Songs: http://www.youtube.com/AdityaDevotional ►For Kids Educational: http://www.youtube.com/AdityaKids →"మా పాట మీ నోట" Telugu Lyrical Songs - http://bit.ly/1B2EcJG →Latest Tollywood Lyric Video Songs - http://bit.ly/1Km97mg →Ever Green Classics - https://goo.gl/1fZEDy →Popular Jukeboxes - https://goo.gl/LNvAIo →Telugu Songs with Lyrics - https://goo.gl/7ZmgWT © 2019 Aditya Music India Pvt. Ltd.
Watch & Enjoy Majili Blockbuster Promos From The Movie Majili. #NagaChaitanya #Samantha #DivyanshaKaushik Click here to share on Facebook- https://bit.ly/2V4RUuM Audio also available on: Wynk- https://goo.gl/L6ZF2m JioSaavn- https://goo.gl/vVJihy AmazonMusic- https://goo.gl/YGXxzK AppleMusic- https://goo.gl/UrVH1b Gaana- https://goo.gl/rtwd6T Spotify- https://goo.gl/qnAUE4 Movie :Majili Banner: Shine Screens Producers: Sahu Garapati and Harish Peddi Story, Direction: Shiva Nirvana Music: Gopi Sunder Cast: Naga Chaitanya, Samantha, Divyansha Kaushik, Rao Ramesh, Posani Krishna Murali, Shatru, Rajasri Nair DOP: Vishnu Sarma Editor: Prawin Pudi Music Label: Aditya Music. ------------------------------------------------------------------------------------------ Enjoy and stay connected with us!! ►Subscribe us on Youtube: http://bit.ly/adityamusic ►Like us on Facebook: http://www.facebook.com/adityamusic ►Follow us on Twitter: http://www.twitter.com/adityamusic ►Follow us on Instagram: https://www.instagram.com/adityamusicindia ►Follow us on LinkedIn: http://bit.ly/2Pp6ze3 ►Circle us: https://plus.google.com/+adityamusic SUBSCRIBE Aditya Music Channels for unlimited entertainment: ►For New Movies in HD: http://www.youtube.com/Adityamovies ►For Songs with Lyrics: https://www.youtube.com/AdityaMusic ►For Devotional Songs: http://www.youtube.com/AdityaDevotional ►For Kids Educational: http://www.youtube.com/AdityaKids →"మా పాట మీ నోట" Telugu Lyrical Songs - http://bit.ly/1B2EcJG →Latest Tollywood Lyric Video Songs - http://bit.ly/1Km97mg →Ever Green Classics - https://goo.gl/1fZEDy →Popular Jukeboxes - https://goo.gl/LNvAIo →Telugu Songs with Lyrics - https://goo.gl/7ZmgWT © 2019 Aditya Music India Pvt. Ltd.
Watch & Enjoy Nagavalli Video Songs - Ghirani Ghira Ghirani Song Starring Venkatesh, Anushka Shetty Subscribe to our Youtube Channel - http://goo.gl/tVbmAU Enjoy and stay connected with us!! Like us: http://www.facebook.com/adityamusic Follow us : http://www.twitter.com/adityamusic Circle us : https://plus.google.com/+adityamusic SUBSCRIBE Aditya Music Channels for unlimited entertainment : Aditya Movies : http://www.youtube.com/Adityamovies Aditya MusicnMovies : https://www.youtube.com/AdityaMusicNMovies Aditya Devotional : http://www.youtube.com/AdityaDevotional Aditya Kids : http://www.youtube.com/AdityaKids Director: P. Vasu Producer: Bellamkonda Suresh Music Director: Gurukiran Cast: Venkatesh, Anushka Shetty, Richa Gangopadhyay, Kamalinee Mukherjee, Shraddha Das, Poonam Kaur, Suja Varunee . 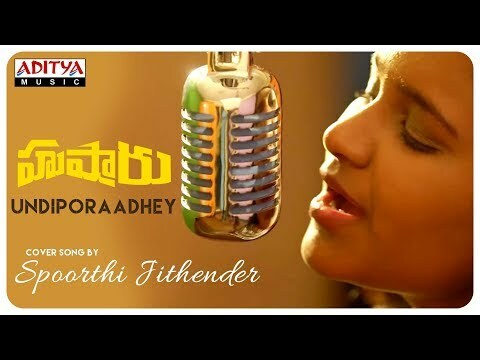 Watch & Enjoy #Undiporaadhey Cover Song by #SpoorthiJithender From Telugu Movie #Hushaaru. Click here to share on Facebook- https://goo.gl/ttfcnD Listen on AppleMusic- https://goo.gl/oSwz8V Audio also available on: JioSaavn- https://goo.gl/oG5frF Wynk- https://goo.gl/PSaQwb Spotify- https://goo.gl/SiLgeP Gaana- https://goo.gl/1Pwkmb AmazonMusic- https://goo.gl/3CssiZ Singer, Cast and Lyrics - Spoorthi Jithender Programming, Mixed and Mastered - Madeen.Sk Editing - Taraka Vamsi Dalapathi Dop - Sathish Kare Song: Undiporaadhey Movie: Hushaaru (Celebration Of Bad Behaviour) Banner: Lucky Media Producers: Bekkem venugopal & Riaz Coproducer: Veena Rani Associate Producers: Linga Srinivas, Laxmi Narayana Director: Sree Harsha Konuganti Music: Radhan Association With : Hk Films, Asin Movie Creations Dop: Raj Thota Editor: Vijay Vardhan Kavuri Art Director: Maresh Shivan Executive Producer: Nagarjuna Vadde (Arjun) Publicity Designer: Anil Bhanu Costume Designer: Anu Reddy Choreography: Shubhash Cast: Tejus Kancherla, Tej Kurapati, Dinesh Tej, Abhinav Medishetti, Daksha Nagarkar, Priya Vadlamani, Hemal Ingle, Ramya Pasupuleti, Rahul Rama krishna Music Label: Aditya Music. ------------------------------------------------------------------------------------------ Enjoy and stay connected with us!! ►Subscribe us on Youtube: http://bit.ly/adityamusic ►Like us on Facebook: http://www.facebook.com/adityamusic ►Follow us on Twitter: http://www.twitter.com/adityamusic ►Follow us on Instagram: https://www.instagram.com/adityamusicindia ►Follow us on LinkedIn: http://bit.ly/2Pp6ze3 ►Circle us: https://plus.google.com/+adityamusic SUBSCRIBE Aditya Music Channels for unlimited entertainment: ►For New Movies in HD: http://www.youtube.com/Adityamovies ►For Songs with Lyrics: https://www.youtube.com/AdityaMusicNM... ►For Devotional Songs: http://www.youtube.com/AdityaDevotional ►For Kids Educational: http://www.youtube.com/AdityaKids →"మా పాట మీ నోట" Telugu Lyrical Songs - http://bit.ly/1B2EcJG →Latest Tollywood Lyric Video Songs - http://bit.ly/1Km97mg →Ever Green Classics - https://goo.gl/1fZEDy →Popular Jukeboxes - https://goo.gl/LNvAIo →Telugu Songs with Lyrics - https://goo.gl/7ZmgWT © 2018 Aditya Music India Pvt. Ltd.